When I finish (as much as we ever finish) telling the story of a particular family line, I always have mixed feelings. In some ways I feel a sense of relief—I’ve accomplished my goal. It feels good to know that I’ve covered to the best of my ability the story of my direct ancestors and their descendants in that family as well as the stories of their siblings and their descendants. But it is also in some ways bittersweet. Each family brings its own color and depth to my family history, and each time I’ve been so fortunate to find living descendants—people who share that history, but know it from a different perspective. As I move away from that story, it feels like leaving a family after a long visit. You’ve just gotten to know them, and now it’s time to move on. Not that I ever forget, and I always try and stay connected with the cousins I’ve found, but my focus shifts. So it’s a separation, and those are always bittersweet. 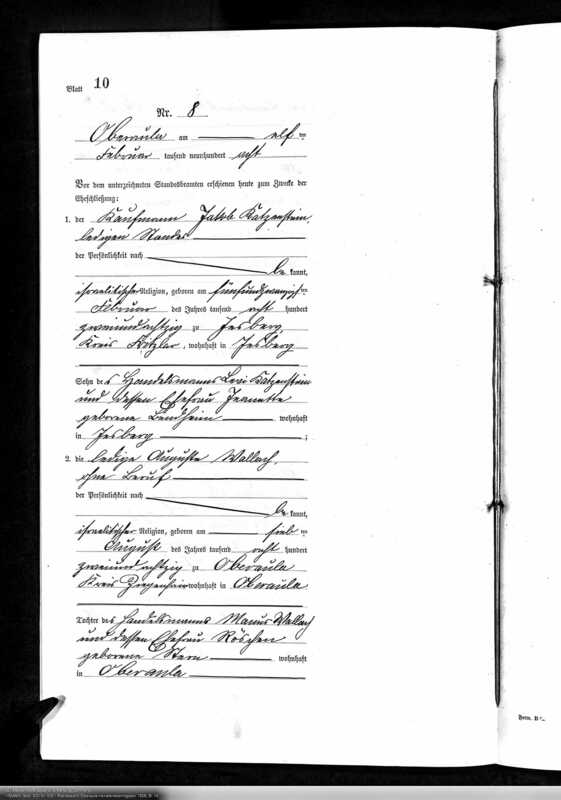 I have been studying the Katzenstein family for over a year now, starting with my great-great-grandfather Gerson and his descendants and then on to each of his siblings and their stories. I have found and in some cases met wonderful new cousins—many cousins who descend from Gerson’s sister Rahel and her husband Jacob Katz and who settled in Kentucky and Oklahoma and Nebraska. There were the descendants of Hannchen Katzenstein Mansbach who lived in West Virginia and Maryland. These are all places where I never imagined I had cousins. Some of those cousins came as children from Germany with their parents to escape Hitler. Some ended up in the US, others in South America, South Africa, and Israel. Other cousins have roots in the US going back to the Civil War. One cousin fought for the Confederacy during the Civil War. My cousins were mostly merchants, and some were cattle ranchers. One of my great-grandmother’s brothers lost his wife and child in the Johnstown Flood. Some cousins lived incredibly long lives; some died far too young. Some were wealthy; some were not. And some never made it out of Germany. Far too many were killed by the Nazis. One was still singing at 93, and one was killed by a terrorist when he was in his 30s. It has been a fascinating and rewarding year for me. I have learned so much about this family and about my Jesberg roots—the town where my great-great-grandfather Gerson grew up and the town he left as a young man with three children in 1856 to come to Philadelphia. My great-grandmother Hilda never saw Jesberg, the town where her father was born and where three of her siblings were born. But I did. 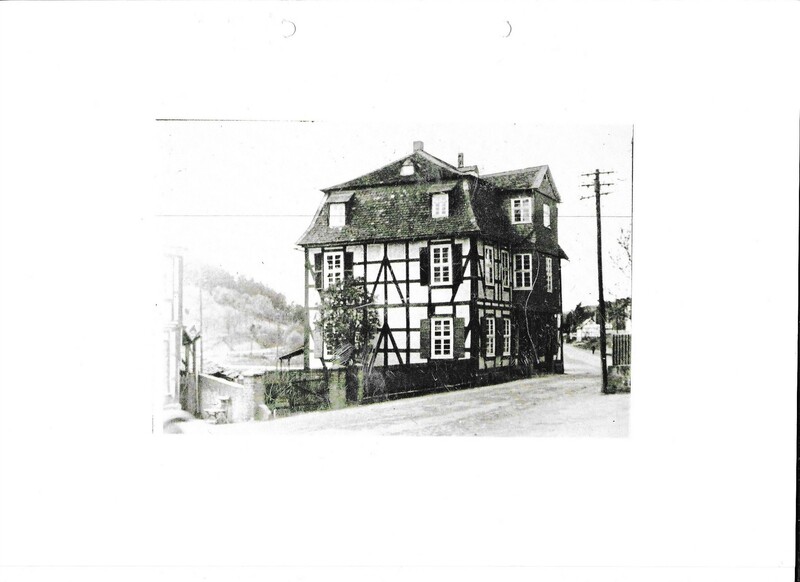 I was able to visit Jesberg in May and see where my Katzenstein family had its roots. 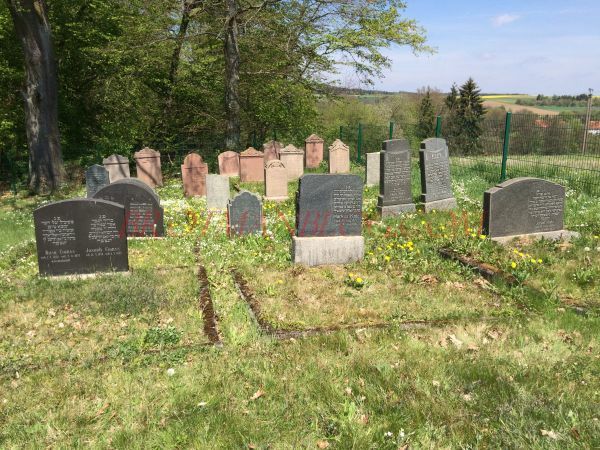 It was a moving experience that would not have been nearly as meaningful if I hadn’t already spent seven months learning about all those Katzenstein ancestors who lived there. So it is bittersweet to move on. I have now written about all eight of my great-grandparents—-Joseph Brotman, Bessie Brod, Moritz Goldschlager, Ghitla Rosenzweig, Emanuel Cohen, Eva Mae Seligman, Isidor Schoenthal, and Hilda Katzenstein. Those are eight of the family names with which I had the most familiarity before I ever started down this path. The names ahead are less familiar—the names of some of my great-great-grandparents—Jacobs, Hamberg, Dreyfuss, Goldschmidt, Schoenfeld, Bernheim, Bernstein, and so on. Which one comes next? Stay tuned. But first some posts to catch up on a few other matters. I did not know the birth names of my great-grandmothers Bessie and Ghitla. 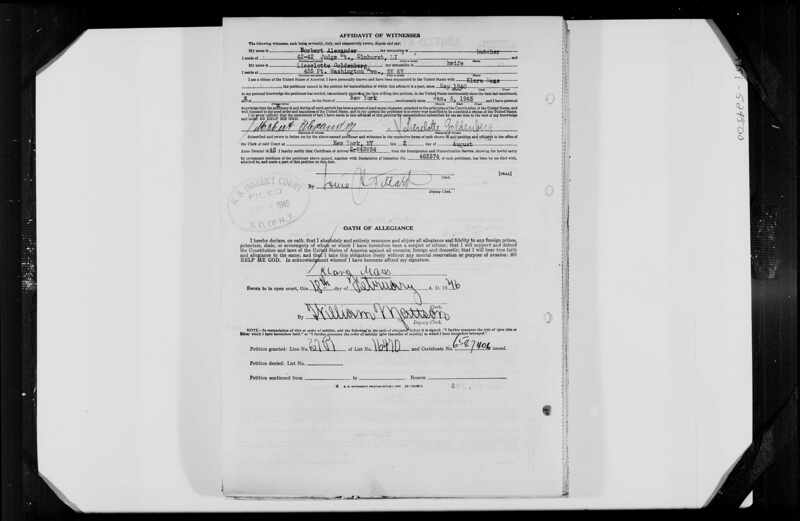 And I did know one more name—Nusbaum, my father’s middle name and the birth name of my great-great-grandmother Frances Nusbaum Seligman. I hope everyone who celebrates had a wonderful Thanksgiving filled with gratitude. This post is about a family heirloom. It doesn’t belong to me, but it is nevertheless something for which I am grateful because it is part of the legacy of my Katzenstein ancestors. I am just about done writing about the Katzenstein line, but before I move on, I want to share this treasure. 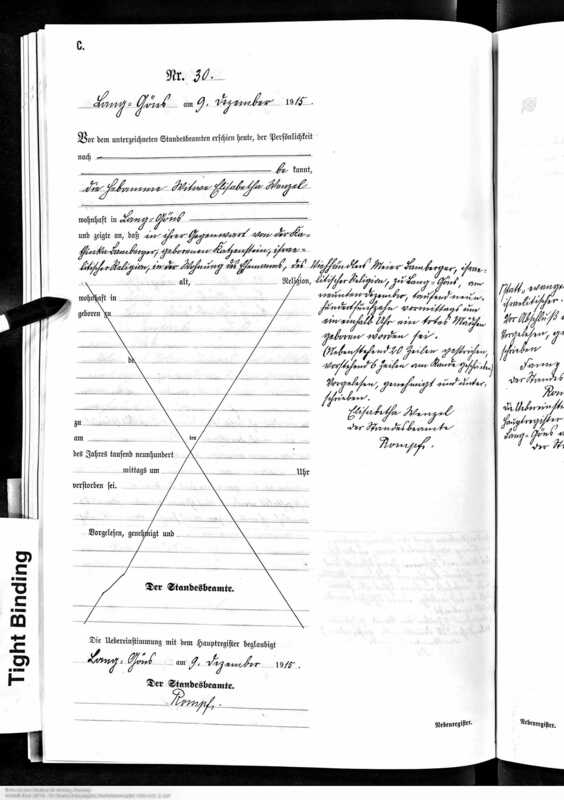 I have referred often on the blog to the work of David Baron, who has done an incredible job of researching the Katzenstein family. David is the husband of Roger Cibella, who is the three-times great-grandson of Gerson Katzenstein, my great-great-grandfather. Roger’s great-great-grandfather was Scholem Joseph Katzenstein, who settled in western Pennsylvania and probably was the one who introduced his little sister Hilda, my great-grandmother, to my great-grandfather Isidore Schoenthal. And Roger is my third cousin, once removed. 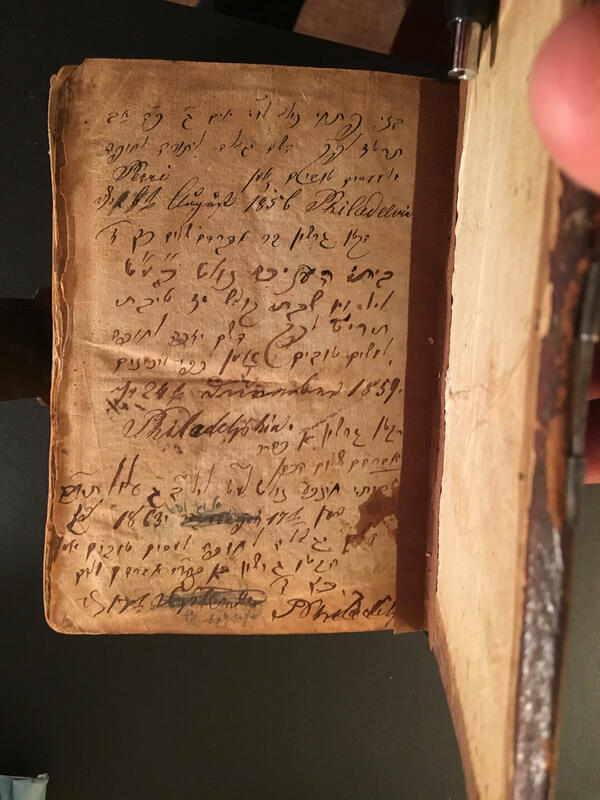 Roger owns a siddur (a Jewish prayer book) that belonged to our mutual ancestor, Gerson Katzenstein. The inner pages of the front and back cover of the siddur contain inscriptions by Gerson marking the births of each of his six children beginning with the birth of Roger’s great-great-grandfather Scholem (with the middle name Abraham here, not Joseph, which I found interesting) in 1848 through the birth of my great-grandmother Hilda in 1863. The book is entitled Beit Rachel v’ Sha’ar Hallel-Ya [House of Rachel and Gate of Praise], and it was edited by Rabbi Naftali ben Isaac Ha Cohen. Rabbi Naftali was born in Ostroh, Ukraine, in 1649 and died in 1719. He married Esther Sheindl, the daughter of Rabbi Shmuel Shmelke Zak of Ostroh, and he headed the yeshiva that his father-in-law built for him in that town. After Rabbi Shmuel died, Rabbi Naftali succeeded him as rabbi. Rabbi Naftali and his wife had fourteen children, seven sons and seven daughters. In 1704 he became the rabbi of Frankfurt, but in 1711, a fire broke out in his home and spread, burning down several hundred homes. Four people died in the fire, and Rabbi Naftali was accused of setting the fire and was put in jail. After he was released, he went to Prague and then Breslau. 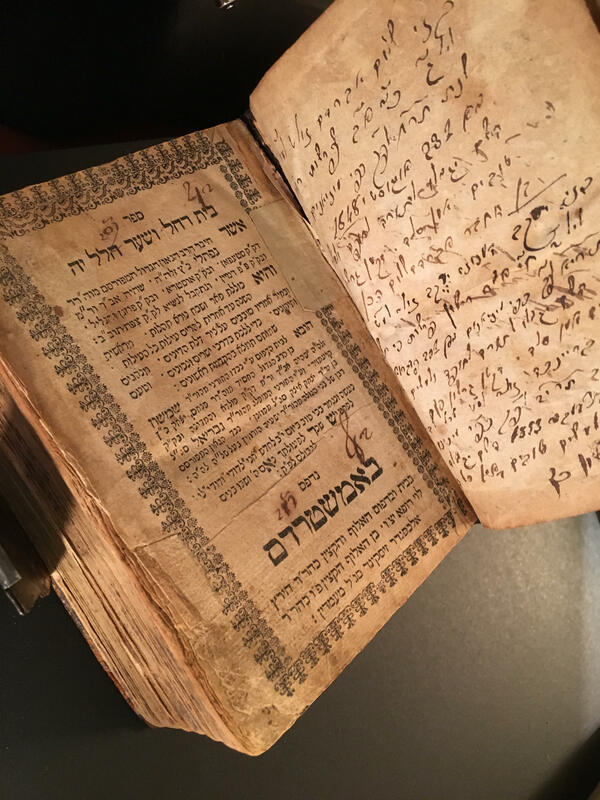 Rabbi Naftali wrote several books, prayers, and hymns as well as the siddur once owned by Gerson Katzenstein. The prayer book was first published in Amsterdam in 1741, but the one Roger owns is probably a later reprint. The book includes the daily prayers and those for Shabbat and holidays as well as other holiday readings and commentary on the prayers and other readings. It also contains the entire book of psalms. My son Shalom Avraham, born on Tuesday night (third day of the week), the 24th of the month of Av, the week of the Torah portion Re’eh, in the year 5608, corresponding to the 23rd of August, 1848. May the Eternal grant my son to learn the Torah, to be married, and to do good deeds throughout his life, amen. Signed: Gershon Ben Abraham Shalom Ha Cohen, Morah [teacher]. My son Pesachya, born Tuesday, the 25th of Av, 5616. He should grow to Torah, the chuppah, and good deeds. August 1856 in Philadelphia. 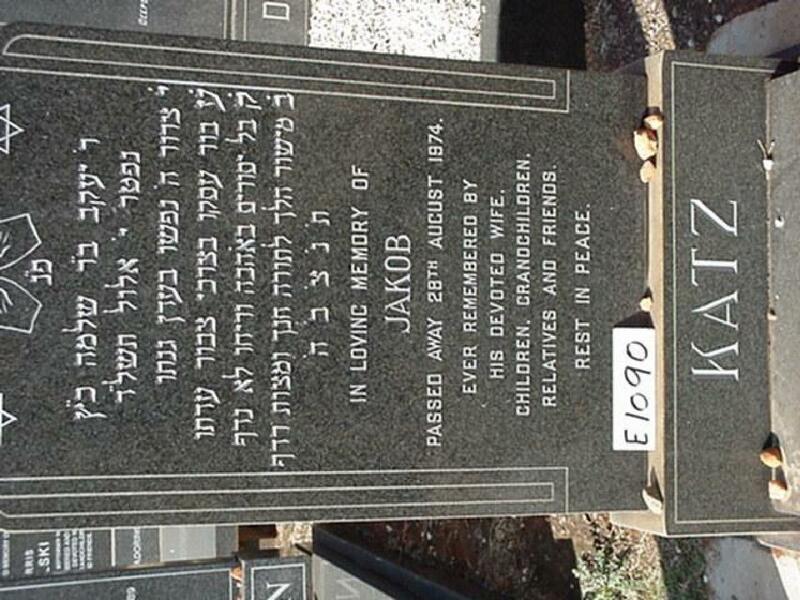 Gershon, son of Avraham Shalom, the righteous kohen. My daughter Henit/Hencha, born on Friday, 17 days in the month of Tevet in 619. May God she grow up strong and do good deeds, get married, amen. Born on December 24th, 1859 in Philadelphia, Signed by Gershon, son of Avraham Shalom the kohen. My daughter Chinke. Born Monday, three days in Elul, the 17 of September [August] 1863. May God grant that she will grow up… Signed Gershon, son of Avraham Shalom, the righteous kohen, in Philadelphia. Leah Cohen of the TTT group pointed out that Gerson described himself as “the small” or ha-Koten in several inscriptions. Leah, Baruch and I could not understand why he referred to himself this way, unless it was a form of modesty. Someday perhaps I will get to meet Roger and David and hold this treasure in my hands, but for now I am delighted to have the photographs and the knowledge that this siddur is in good hands with Roger and David. How painful it must have been for this family to lose a son to terrorism in Germany in 1970 after escaping from the Nazis in Germany less than forty years before. 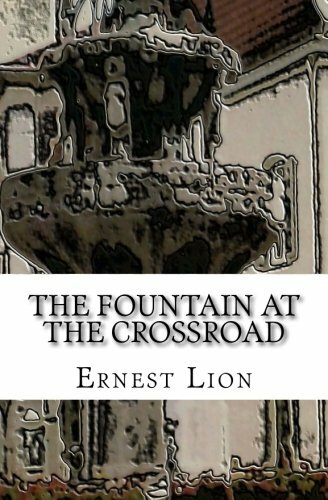 This is the story of the family of Levi Katzenstein, the youngest child of the nine children of my three-times great-uncle Jakob Katzenstein and his wife Sarchen Lion. 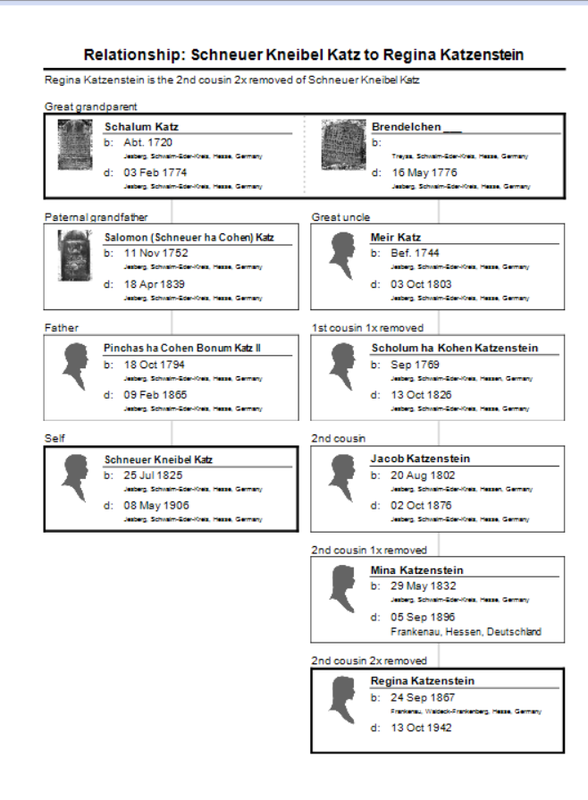 With this post I will have covered as best I can at this point the lives of all the descendants of Scholem Katzensten, my 4-times great-grandfather. In some ways Levi’s story reflects the stories of all his siblings; there are children who died young or who were stillborn. There are children who were killed in the Holocaust. And there are children who escaped from Nazi Germany and whose descendants are alive today in various places in the world. And in this family, there was a hero who made the ultimate sacrifice to protect other people. Levi was born on May 29, 1851, in Jesberg. He married Jeanette Bendheim on August 13, 1878. Jeanette was born July 17, 1858, in Friedberg, Germany, daughter of Wolf Bendheim and Johanette Schering or maybe Schwarz (the mother’s birth name is very hard to read; these were the possibilities given by members of the Jekkes group on Facebook. I can’t read it at all.). Levi and Jeanette had six children, four sons and two daughters. Their firstborn was Kathinka, born on November 25, 1879, in Jesberg. Then came two sons, Jakob and David. Jakob was born February 25, 1882, six years after the death of his grandfather Jakob for whom he must have been named. David was born two years later on March 3, 1884. Sadly, the fourth child did not make it to her first birthday. Sara was born July 14, 1886, and died on May 11, 1887. The last two children were boys. Sally Katzenstein was born on April 10, 1890, and Max Katzenstein was born on May 15, 1893. Four of the five children of Levi and Jeanette Katzenstein married and had children. 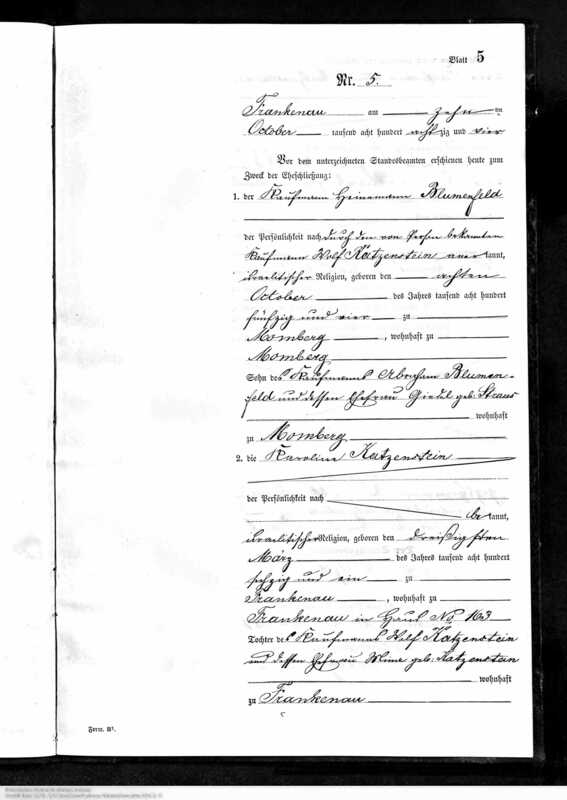 Kathinka married Meier Bamberger on August 8, 1905, in Jesberg. Meier was born on June 8, 1878, in Holzheim, Germany, the son of Joseph Bamberger and Settchen Meier. 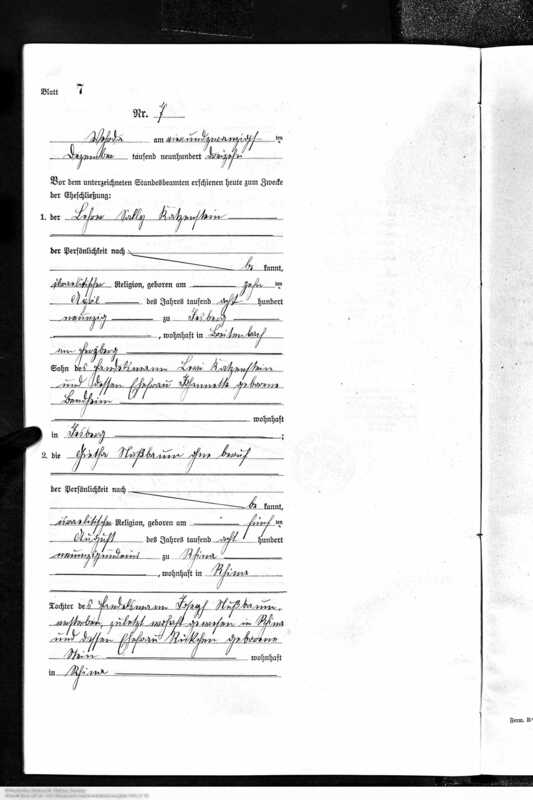 Kathinka and Meier Bamberger had one child who survived, a daughter Gertrud born in Holzheim on May 7, 1910, and also had a stillborn child on December 9, 1915. 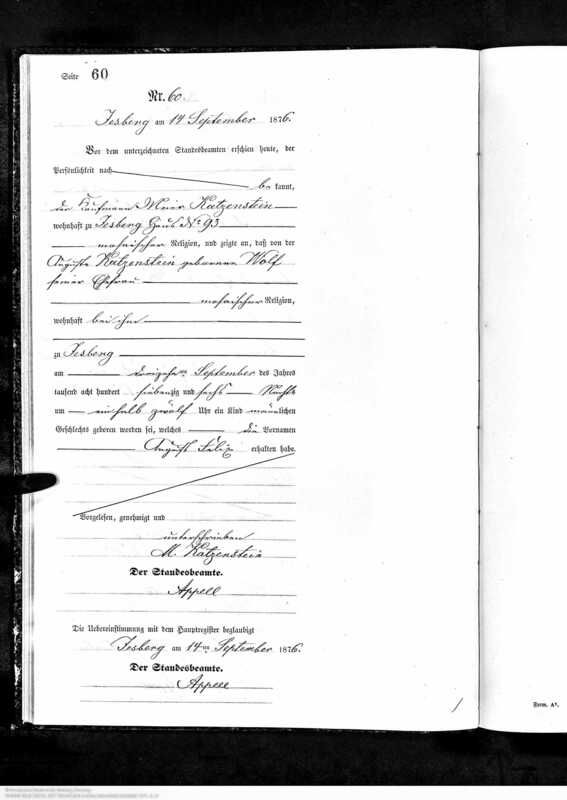 Kathinka’s brother Jacob married Auguste Wallach on February 11, 1908, in Oberaula, Germany. 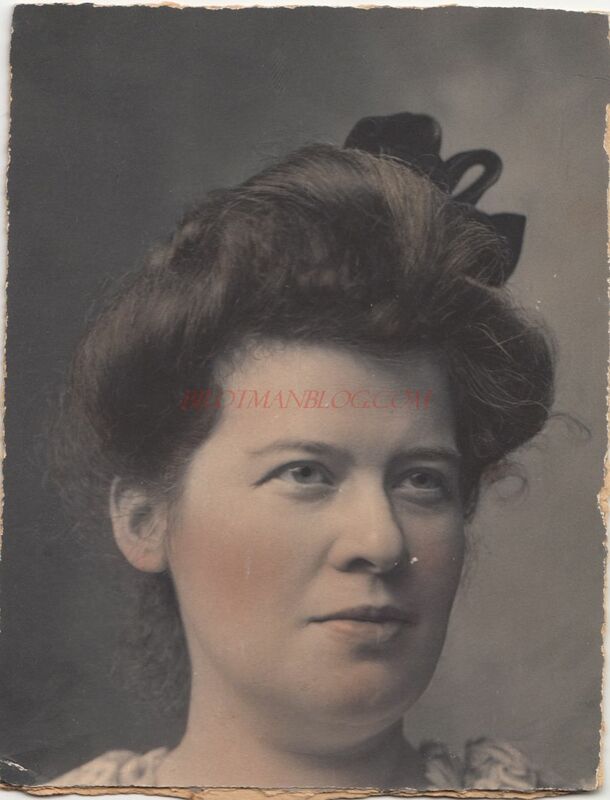 Auguste was the daughter of Manus Wallach and Roschen Stern, and she was born on August 7, 1882, in Oberaula. 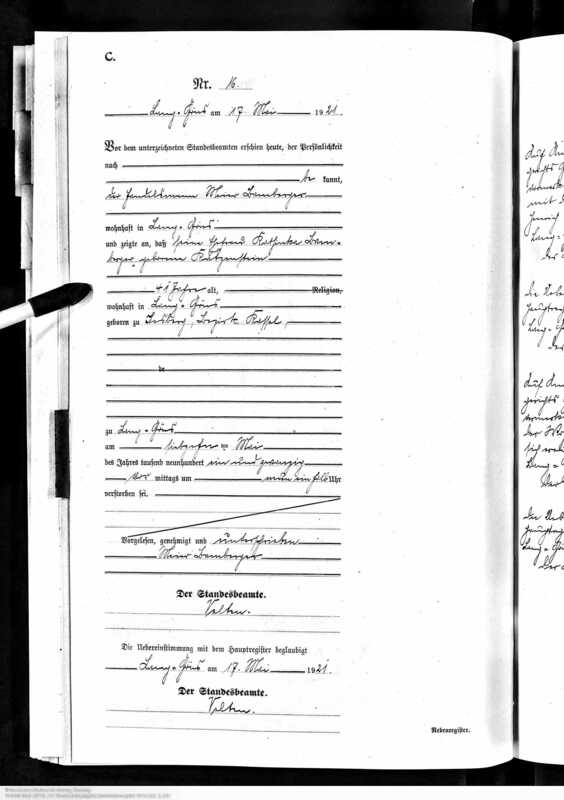 Jacob and Auguste had one child, a son named Benjamin Willi born in Jesberg on November 18, 1908, according to the research done by Barbara Greve. 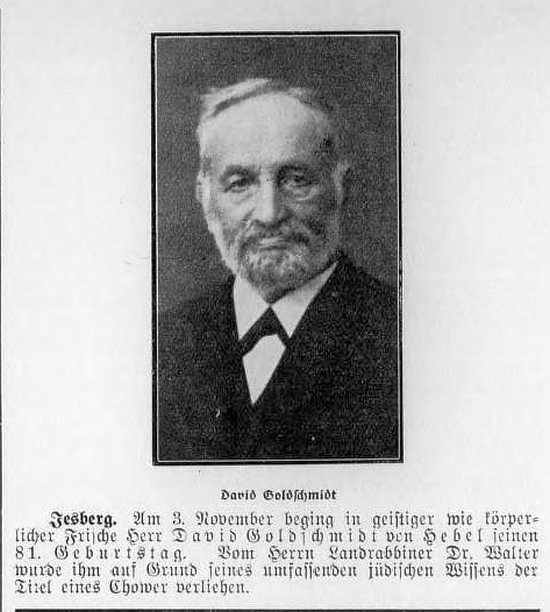 David Katzenstein married Gertrude Spier on January 7, 1912 in Merzhausen, Germany. Gertrude, the daughter of Juda Spier and Jeanette Rothschild, was born in Willinghausen, Merzhausen, Germany, on December 10, 1887. The fourth surviving child of Levi and Jeanette was Sally Katzenstein. He married Gretha Nussbaum on December 24, 1913, in Wurda, Germany. She was the daughter of Joseph Nussbaum and Rickchen Stein, born in Rhina, Germany, on August 5, 1991. Sally and Gretha had two daughters, Elfriede (1914) and Ruth-Rika (1924). The youngest child of Levi Katzenstein and Jeanette Bendheim was their son Max. Tragically, Max was killed fighting for Germany in World War I on June 4, 1915. According to Barbara Greve’s research, Max served as a musketeer in the Third Company of the 7th Infantry, Regiment No. 142. He was 22 years old. Given what happened to some of his siblings, his sacrifice for Germany is especially tragic. Levi and Jeanette Katzenstein had thus already lost two of their children—their daughter Sara and their son Max. Then on May 17, 1921, they lost yet another child, their only other daughter Kathinka Katzenstein Bamberger. She was only 41 years old and left behind her husband Meier and their eleven year old daughter Gertrud. Meier remarried seven months later on December 23, 1921; his second wife was Zerline Kahn, stepmother to little Gertrud. After Kathinka’s death, Levi and Jeanette had only their three sons Jakob, David, and Sally surviving as well as their grandchildren. Levi died on April 3, 1929, and Jeanette died a year later on July 22, 1930. Levi and Jeanette’s remaining family did not get to stay in their ancestral town of Jesberg. According to Barbara Greve, David Katzenstein was forced to sell his home and farm after the Nazis came to power. He and his family left for Palestine in 1934. His brother Jakob left three years later in 1937. 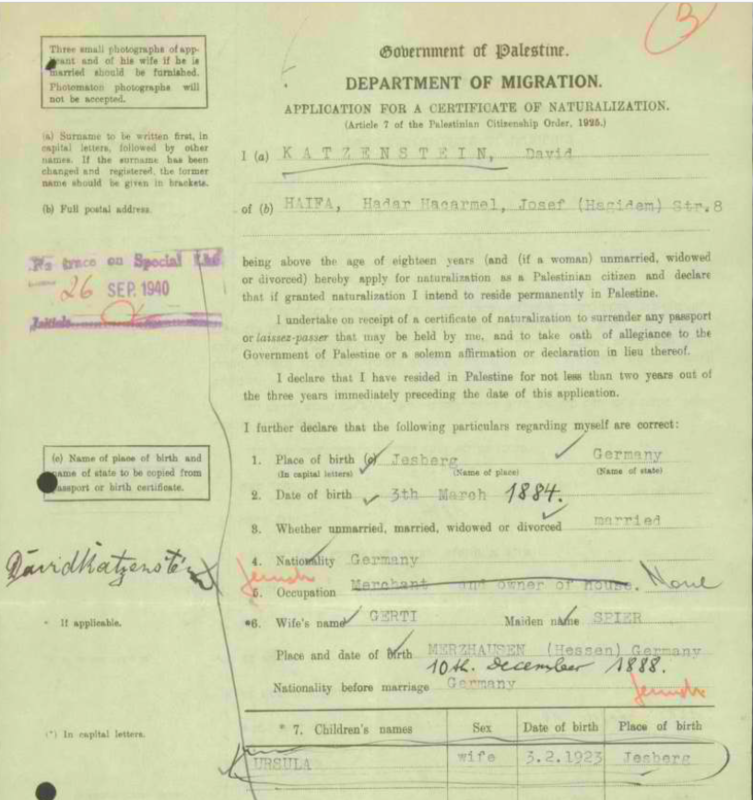 Jakob and David and their families survived the Holocaust and settled in Palestine where, as these documents reveal, they became naturalized citizens. Sally Katzenstein was a teacher and a preacher. He taught in an Israeli school in Breitenbach, North Hessen, from 1911 and from 1921 until 1934 at the state school in Soest. At both schools he also had the responsibility for teaching four hours each week at a school for further education. In Soest he was [a] preacher to the Synagogue congregation. Shortly after the National Socialists took over power on the 7th April, 1933, the law for the Reinstatement of the Career Civil Servants was passed. This was to enable the removal of unwanted officials, especially Jews, from governmental posts. Sally Katzstein also fell foul of this law and on 29th March, 1934, lost his occupation as a teacher. 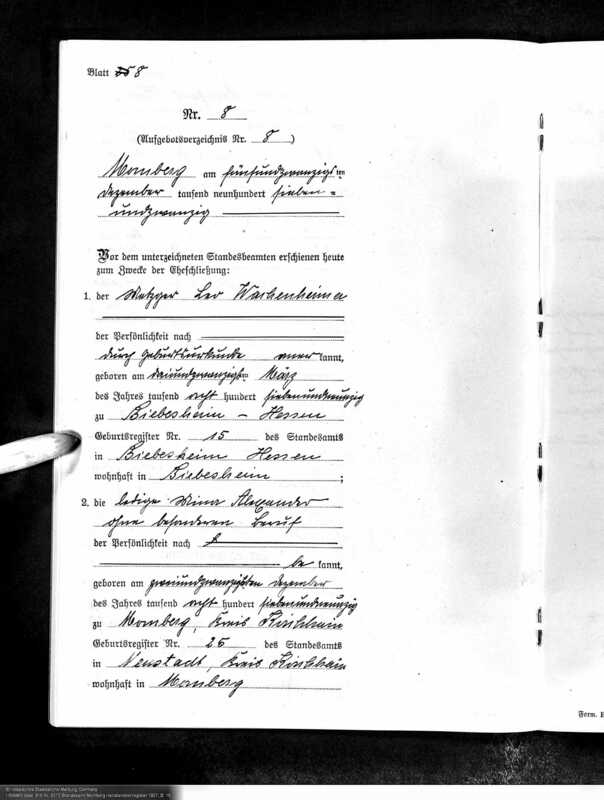 On 1st September, 1935, the family moved to Minden and found a home in Wilhelmstrasse 18. Sally Katzenstein became the local representative for the National Association of Jews in Germany and later preacher to the Synagogue Community. As Jewish children were banned from State schools he held lessons in private rooms. 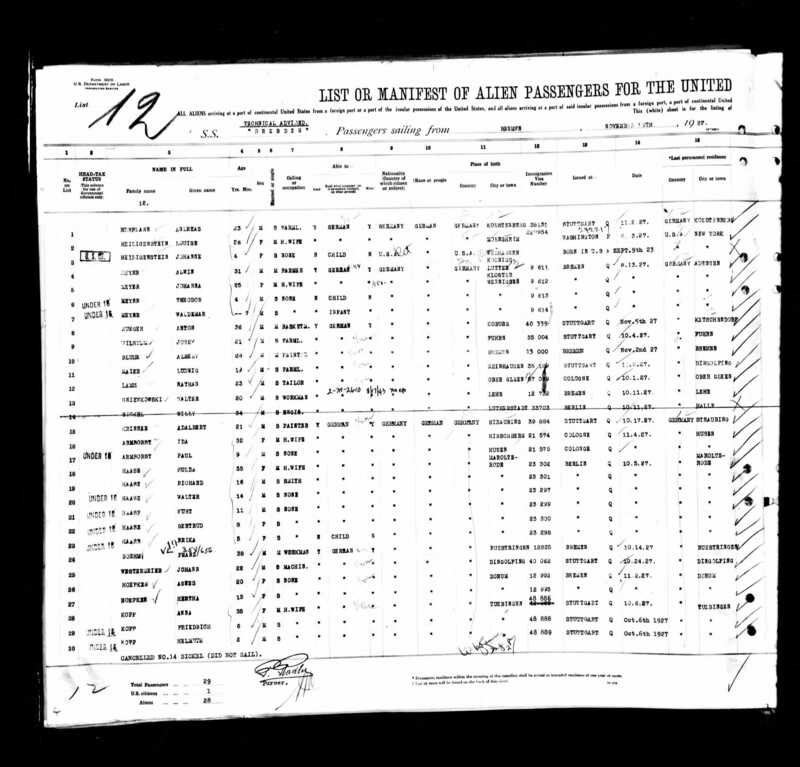 After the November Pogrom of 1938 Sally Katzenstein was required to pay 1.400 Reichsmark tax on his fortune. These taxes were cynically called ‘Jewish Punishment Tax’. With this money the Jews had to pay for damage that had been done to their property, by others, during the Pogrom. 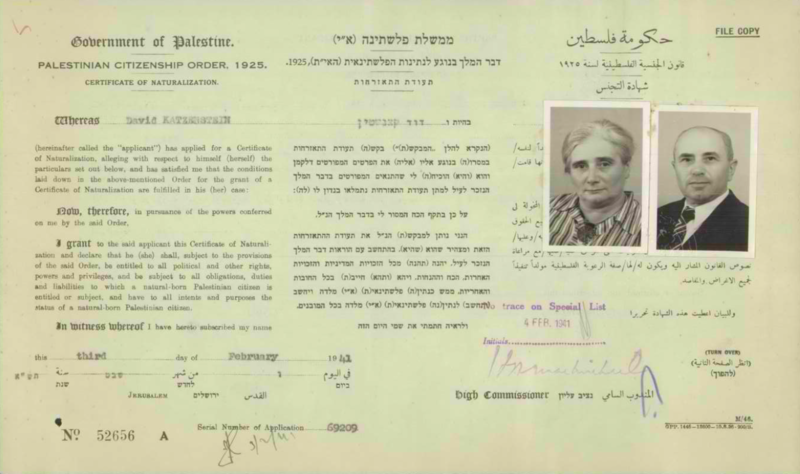 In 1939 the family tried to emigrate to Palestine but only their daughter, Ruth Rika, was given permission to leave. Her sister, Elfriede, had emigrated in 1936. In 1941 Sally and Gretha submitted an application to emigrate to the USA and permission was granted but then was foiled by the USA entering the war. In 1941 the Katzensteins were forced to leave their home and to move into the so called Jewish house in Kampstrasse 6, The Jewish community house together with lots of other Jews, in very cramped conditions. 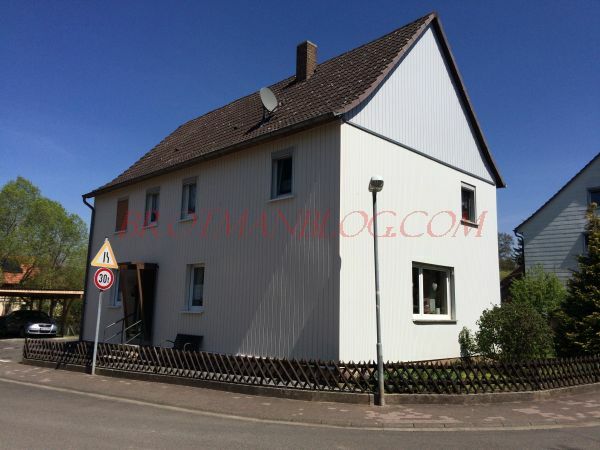 In the spring of 1943 Sally and Gretha Katzenstein were the last Jews living in Minden but they were arrested and taken to Bielefeld and from there were deported to Teresienstadt. From there they were taken separately to Auschwitz where they were both murdered in October 1944. Fortunately, both of Sally and Gretha’s daughters survived. 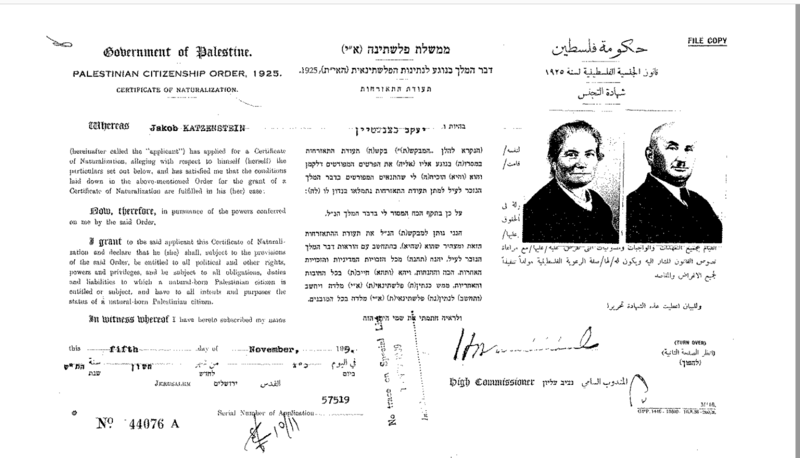 Elfriede, their older daughter, married to Siegfried Berliner, settled in Palestine, now Israel, where she died on December 8, 2011, according to this obituary. She was 97 years old and had three children. Her sister Ruth Rika Katzenstein married Harold Rosenberg and settled in Scotland where Ruth was registered as a nurse for many years. I have not yet found a death record for Ruth nor do I know whether she had any children. There is one final tragic story to tell about the descendants of Levi Katzenstein. 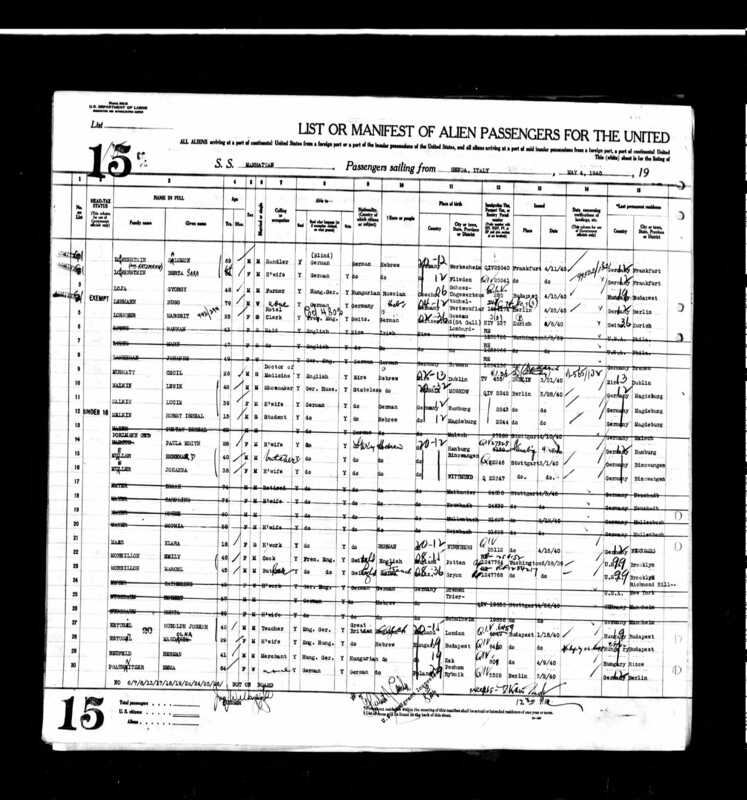 As noted above, two of his sons, Jacob and David, immigrated to Palestine in the 1930s. David and his wife Gertrude had three children: Heinz, Erich, and Ursula. Heinz had a son named Arye born in Haifa, Israel, in 1937. The attack in Germany occurred on February 10, 1970, at 12:50pm. An El Al plane on Flight 435 from Israel had landed at the airport shortly before. Some passengers intended to continue to London, [and] were on their way to a bus that would take them to a connecting flight. A scream was suddenly heard and three young Arab men came from the direction of the transit hall stairs, shouting and running towards the bus, ordering passengers to put their hands up. The captain tackled the assailants, but they managed to toss two hand grenades at the bus. One of the terrorists pulled out a gun, and another grenade was thrown. Arye Katzenstein of Haifa, 32 at the time, was on the bus with his father and sprinted towards one of the grenades. He used his body to prevent other passengers from being wounded. He died at the scene and his father was severely wounded. Arye Katzenstein, my fourth cousin, was a hero. His family had left Germany to escape from the Nazis, and almost forty years later he was killed in Germany while trying to protect others from a terrorist attack. It does make me wonder whether hate will ever end. It also makes me realize that there will always be good people who will fight that hate and provide us all with hope and inspiration. 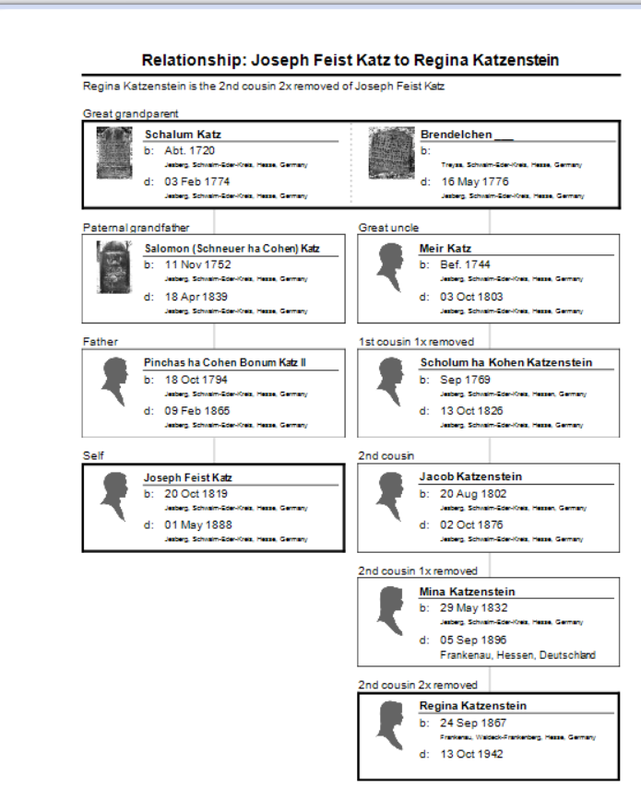 I am now more than half way through the nine children of my three-times great-uncle Jakob Katzenstein and his wife Sarchen Lion; there are four more to go, and this post will cover three of them: Pauline, Baruch, and Meier. 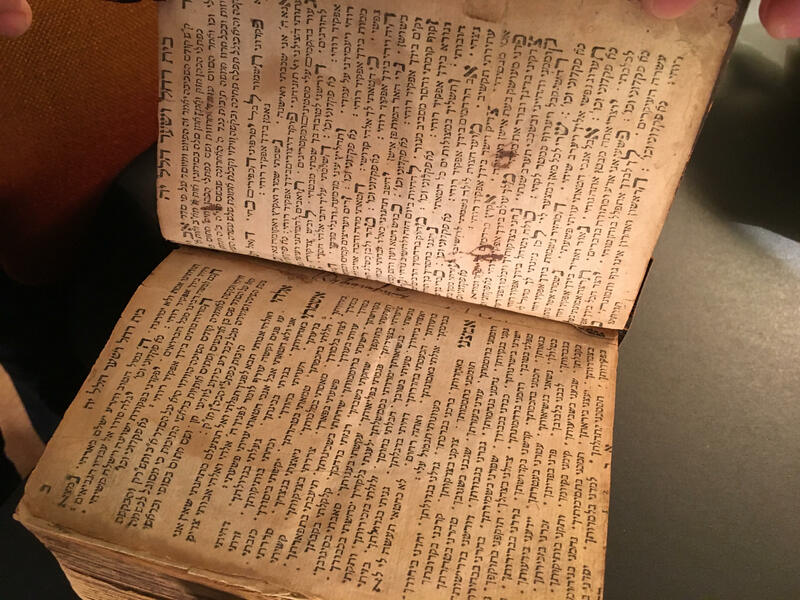 Special thanks to Cathy Meder-Dempsey for her help in translating some of the records in this post. Sadly, I have very little to report about Pauline. She was born on May 12, 1841, in Jesberg, and died in Jesberg 61 years later on December 27, 1902. She did not marry or have children and presumably lived in Jesberg all her life. As explained to me by Cathy Meder-Dempsey, the marginal notation refers to the fact that Pauline died without an occupation. She is buried in the cemetery in Jesberg, where I took this photograph of her gravestone. I am sorry that I do not know more about her life. 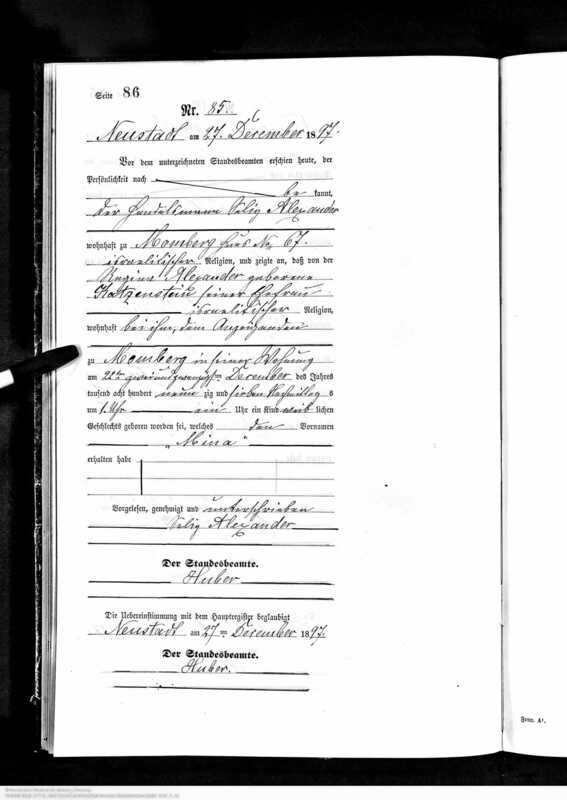 Baruch, the seventh child of Jakob and Sarchen, was born April 30, 1844, in Jesberg, and died there when he was 75 on March 26, 1920. I also know very little about his life. 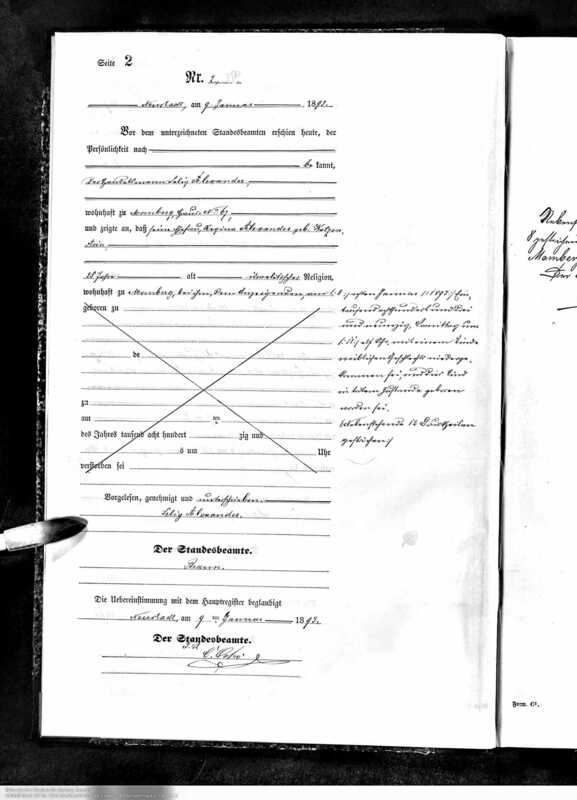 Although I could not locate a marriage record, it appears that Baruch married Auguste Bertha Schlesinger, according to her death record. 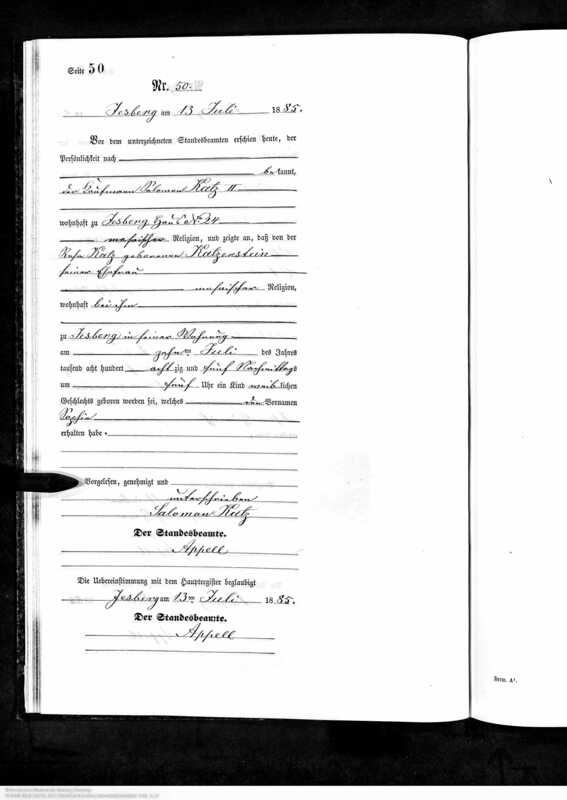 She was born in Gladenbach in 1850 and died in Jesberg on November 2, 1890. 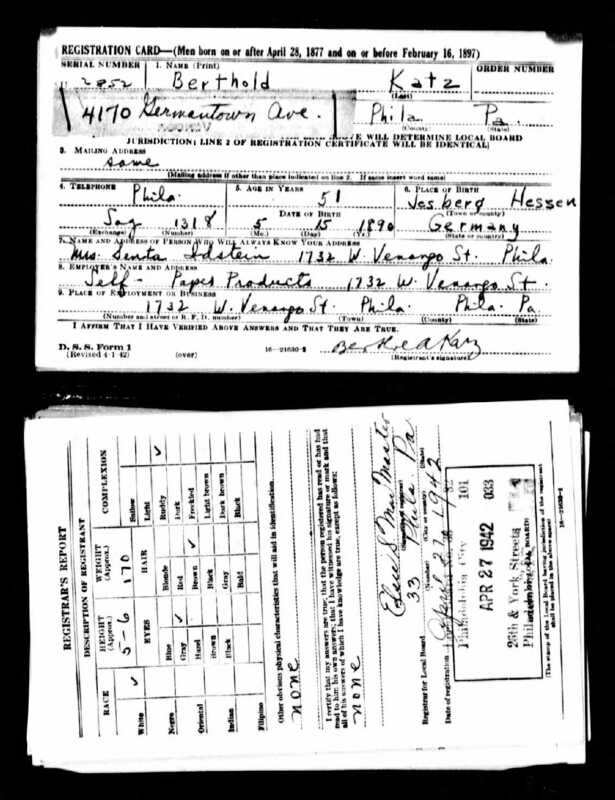 She was the daughter of Feitel Schlesinger and Gelle Wolf, according to her death record. 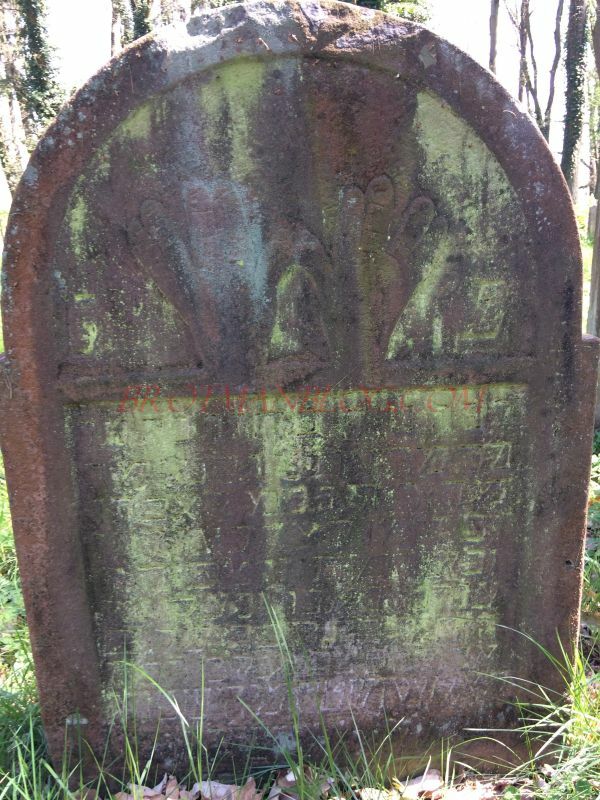 I was able to photograph the headstone for Baruch Katzenstein in Jesberg, but I don’t know where Auguste was buried. She died thirty years before Baruch and before the “new” Jesberg cemetery was being used. 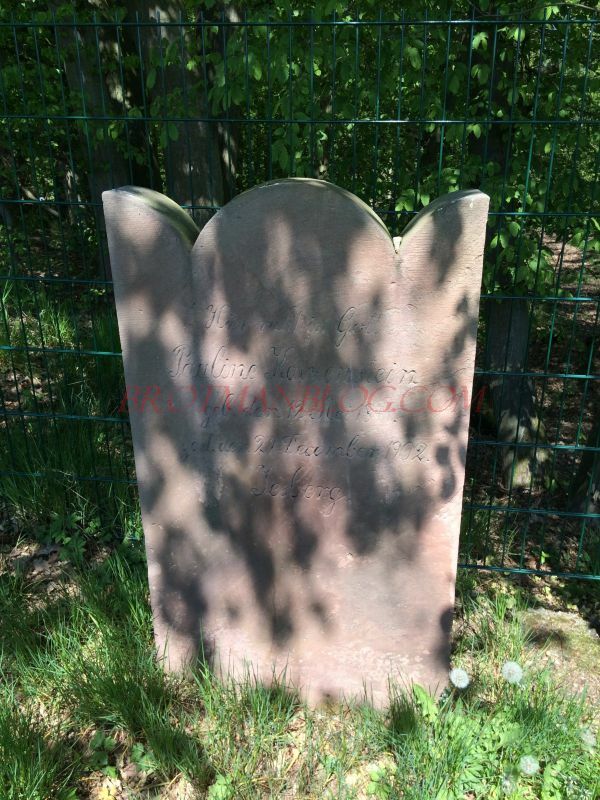 She should have been buried at Haarhausen cemetery, where the other Katzenstein family members were buried before Jesberg opened its own cemetery. 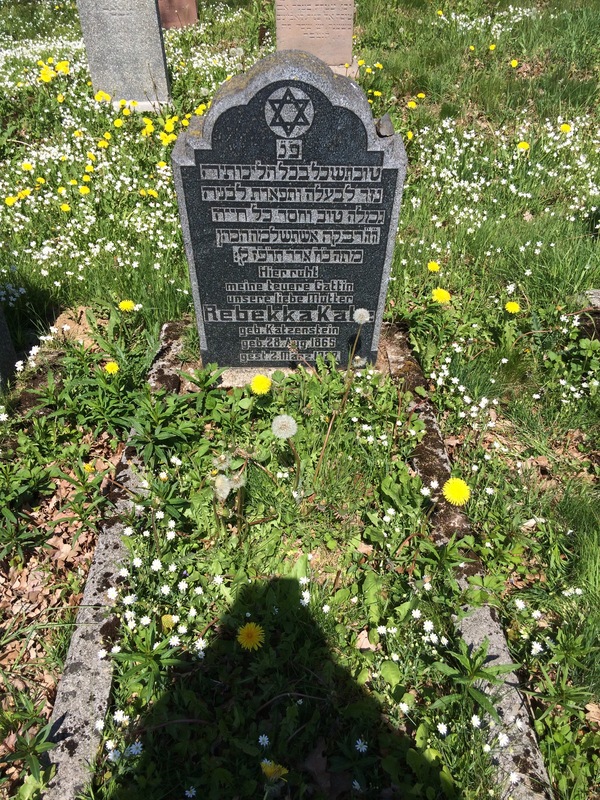 But there is no record of her burial there on the LAGIS website, nor can I find a record of her burial at any of the other Hesse region Jewish cemeteries. Also, as far as I can tell, she and Baruch did not have any children. Fortunately I have a little more information about Jakob and Sarchen Lion’s eighth child, Meier, but it is a very sad story. Meier was born April 26, 1849. 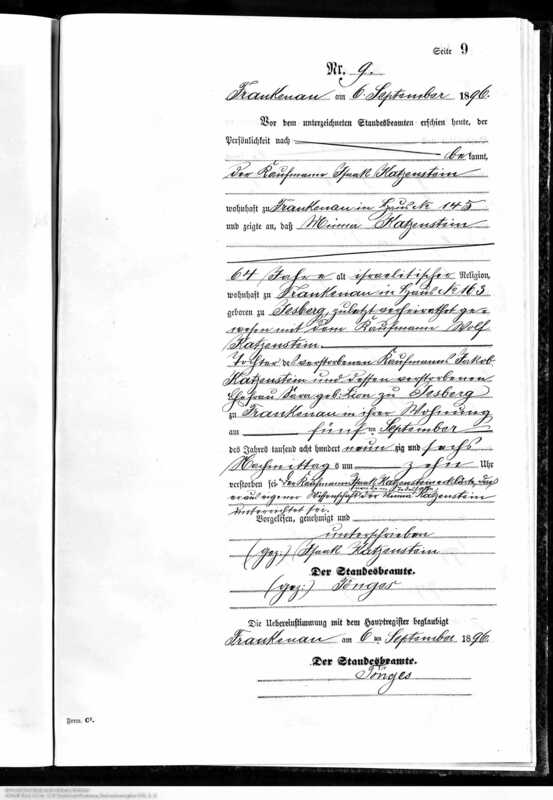 Sometime before September 1876, he married Auguste Wolf, who was born on October 27, 1851, in Gladenbach, Germany, to Folk Wolf and Ester Stern. 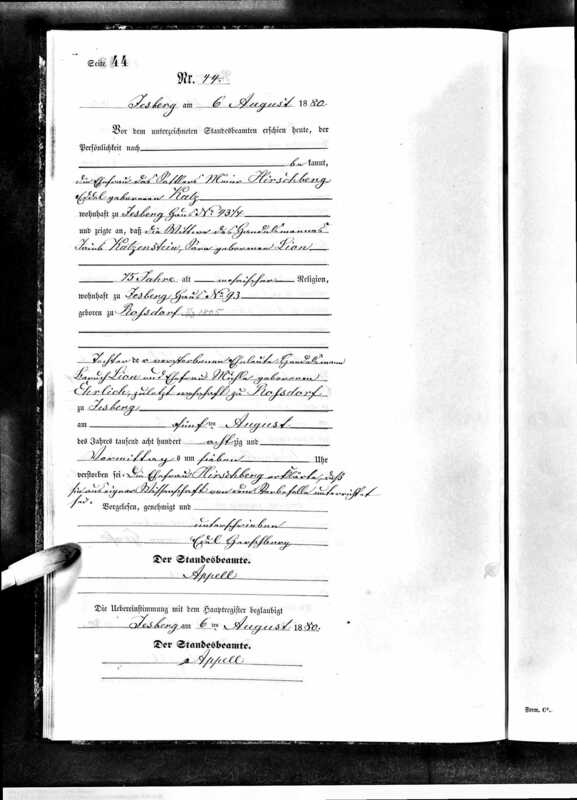 On September 13, 1876, Auguste Wolf Katzenstein gave birth to a son, August Felix Katzenstein. Six days later, Auguste Wolf Katzenstein died on September 19, 1876, leaving behind her husband Meier and her infant son. She was not yet 25 years old. How Meier raised the baby for the next year and half is unknown, but then he married again. 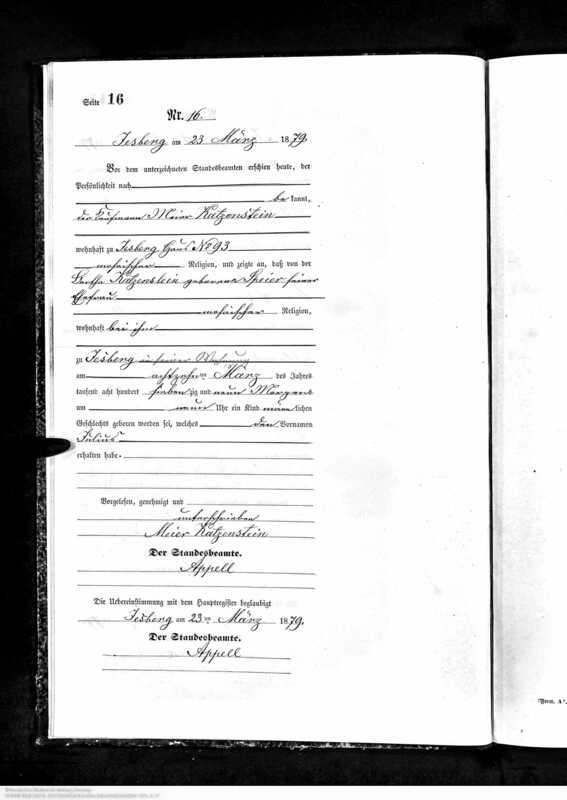 On May 19, 1878, he married Bertha Spier, daughter of Moses Spier and Roschen Fackenheim. Bertha was born in Raboldshausen on May 13, 1853. 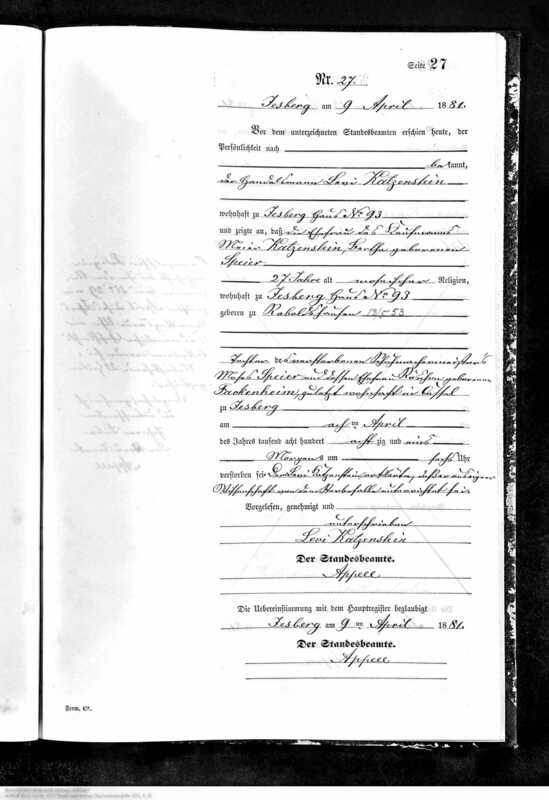 Bertha gave birth to the couple’s first child, a son named Julius, on March 18, 1879, in Jesberg. A second child was born on July 2, 1880, a daughter named Ida. Ida only lived ten months; she died on April 1, 1881. Her mother Bertha died one week after her baby daughter on April 8, 1881. She was 27 years old. It seems too cruel to imagine that in the space of less than five years Meier lost two young wives and a ten-month-old child. He died just three years after Ida and Bertha on September 10, 1884, in Jesberg. He was 35. Meier left behind his two sons, August Felix Katzenstein, who was only eight years old when orphaned, and Julius Katzenstein, his half-brother who was only five years old. Where did these two little boys go after losing both of their parents? Did they go to live with their aunts or uncles who lived in Jesberg or nearby? I don’t know. 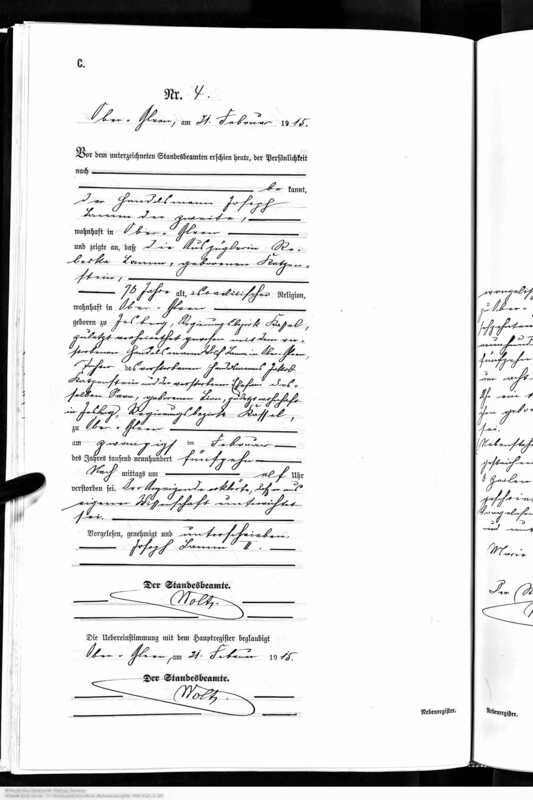 In fact, I have no further record for Julius Katzenstein—no marriage record, no death record. I wonder if he was adopted by a relative or another person and took on a new surname. Or did he also die as a child without a recorded death? I don’t know. As for August Felix Katzenstein, his tragic story has already been told. He married his first cousin, once removed, Rosa Bachenheimer. August Felix was the grandson of Jakob Katzenstein and Sarchen Lion through their son Meier, and Rosa was their great-granddaughter through their daughter Gelle Katzenstein Ruelf and granddaughter Esther Ruelf Bachenheimer. Thus, unless Julius Katzenstein survived, there are no descendants of these three children of Jakob Katzenstein and Sarchen Lion. Not a single soul alive to pass on the genes and the stories of Pauline, Baruch, or Meier Katzenstein. That leaves only one more child of Jakob Katzenstein and Sarchen Lion, their youngest child, Levi. Because he had six children, I will tell his story in a separate post. As I said, many of the stories in this line of the family do not have happy endings. And it doesn’t get better with the next child of Jakob Katzenstein and Sarchen Lion, their fifth child and fourth daughter, Johanna. But there is hopefulness in this story as well. 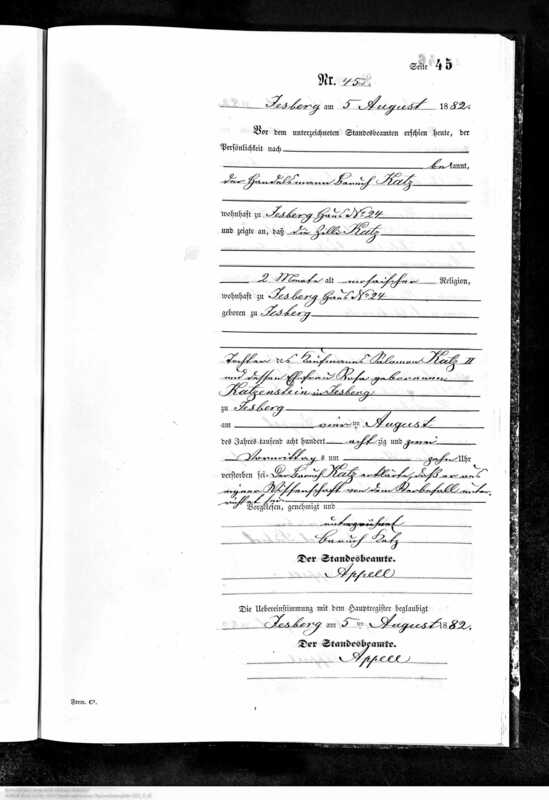 As reflected on Reverend Bach’s report on the family of Jakob Katzenstein and Sarchen Lion, Johanna/Hanna was born on December 28, 1838, in Jesberg. 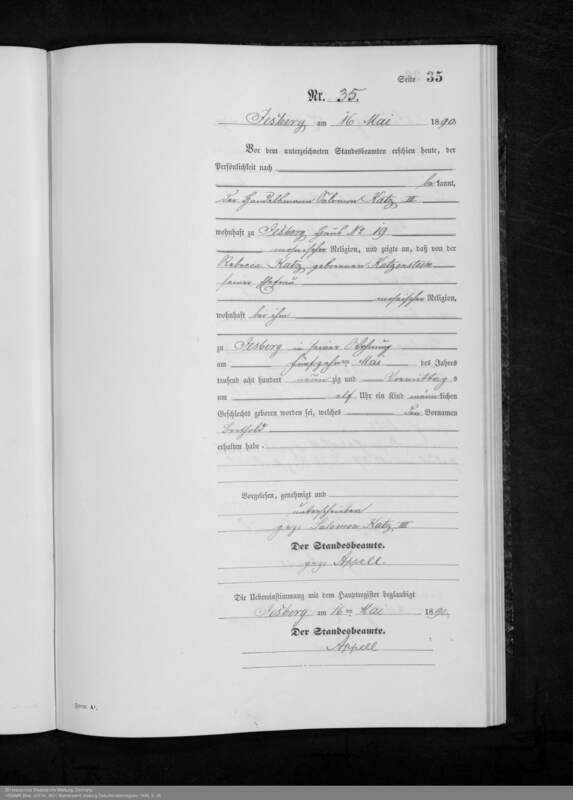 She married Simon Maas, who was five years younger than Johanna and born in June 1843 in Mardorf. 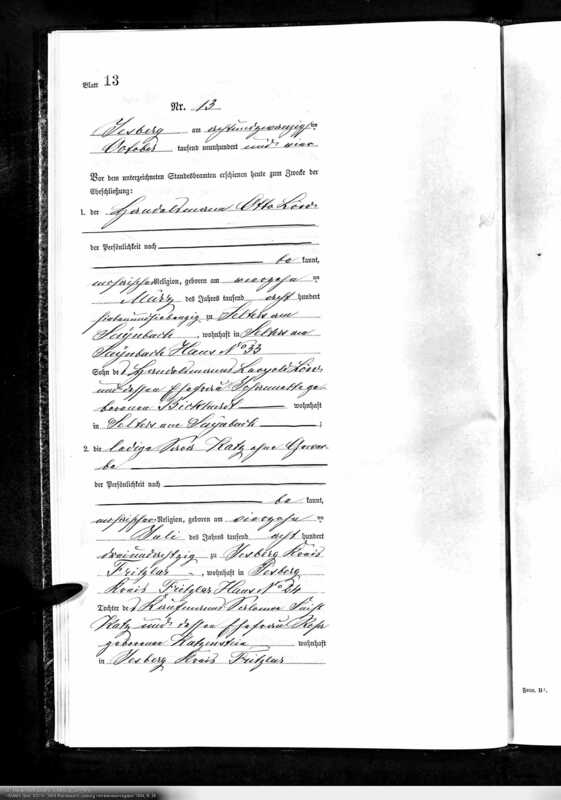 According to Barbara Greve’s research, Johanna and Simon married on December 3, 1873. If so, Johanna was 35 and Simon 30. Their first child was born on April 26, 1875, in Mardorf, a daughter named Gidel, also known as Auguste. Their second child was a son, Jacob Levi, born on September 28, 1876. Johanna died on March 18, 1892; she was 53 years old. Her husband Simon Maas died on April 22, 1910, at age 66. Their son Jakob married Rosa Goldenberg on July 26, 1907 in Kestrich, Germany. Rosa was the daughter of Dobel Goldenberg and Lina Baer. Rosa Goldenberg was also the sister of Nathan Goldenberg, whose wife Regina Katz was the granddaughter of Rahel Katzenstein, who was the sister of Jakob Maas’ grandfather Jakob Katzenstein. 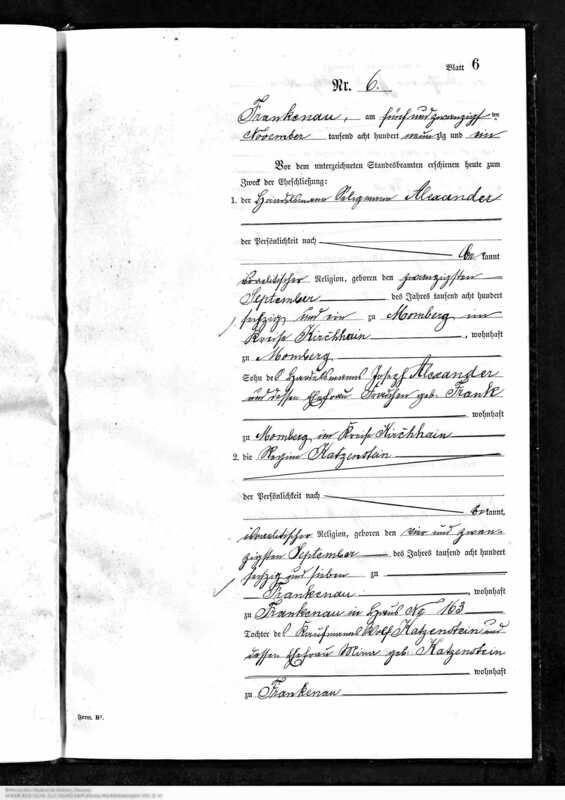 Thus, Rosa married a descendant of Jakob Katzenstein and her brother Nathan married a descendant of Rahel Katzenstein. 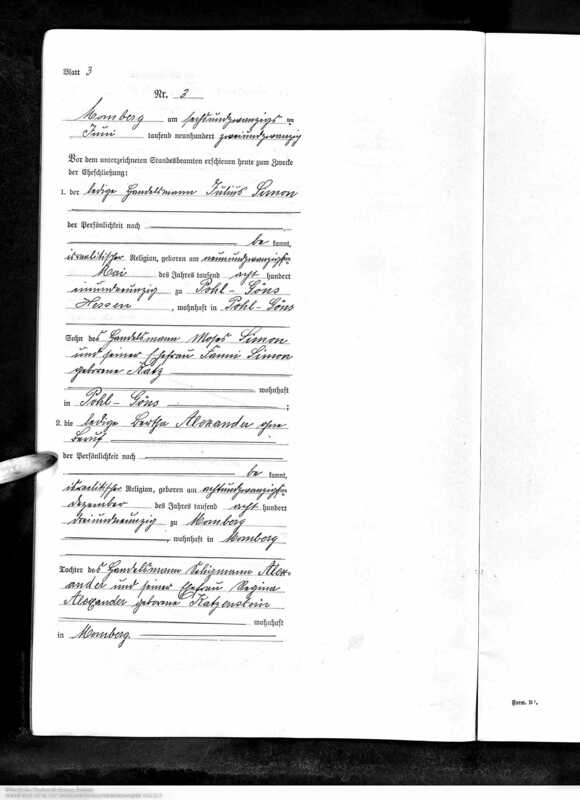 Jakob and Rosa had one child, a daughter Klara born in 1921. Neither of the two children of Johanna Katzenstein and Simon Maas survived the Holocaust. 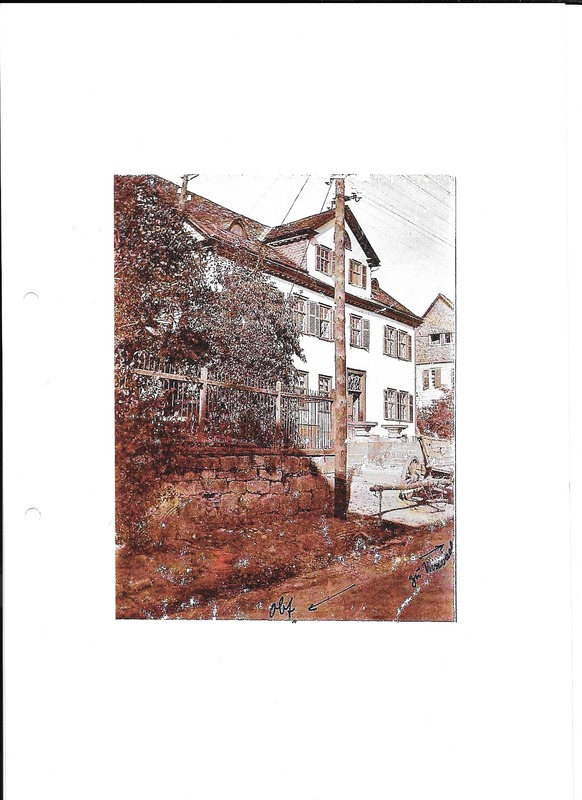 On March 15, 1939, their daughter Auguste was sent to the Jakoby Institute in Sayn-Bendorf, at one-time a well-regarded psychiatric hospital for Jews that was warped into a facility used by the Nazis to mistreat Jewish patients. Auguste Gidel Maas is buried in one of those unmarked graves in Sayn-Bendorf. She died on October 29, 1941, according to the JewishGen Online Worldwide Burial Registry (JOWBR). She was 66. . Her brother Jakob Levi Maas was arrested on May 6, 1941, and imprisoned at a forced labor camp in Breitenau. Two months later on July 18, 1941, he was sent to the Sachensausen concentration camp, where he died on May 16, 1942, according to Yad Vashem. His wife Rosa was also killed by the Nazis. She was sent to Theriesenstadt on September 7, 1942, and then to Auschwitz on January 23, 1943, where it is presumed she was murdered. 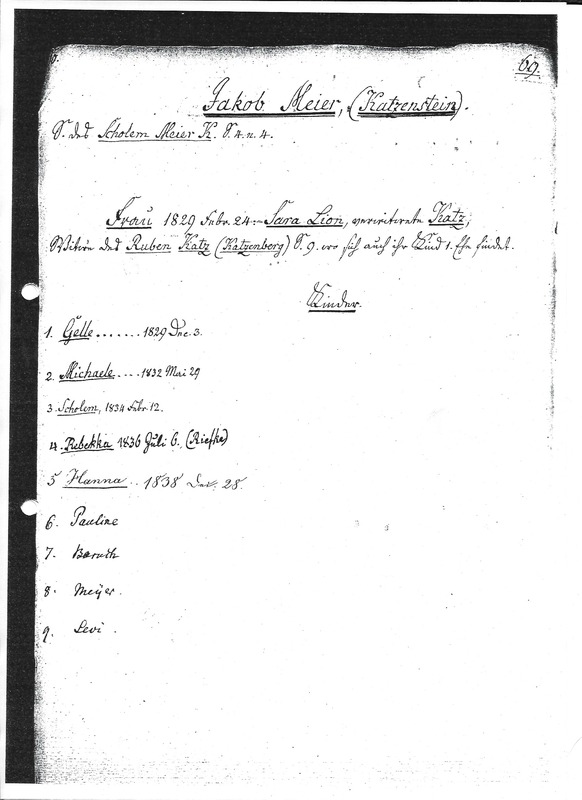 The only descendant of Johanna Katzenstein and Simon Maas who was not killed by the Nazis was Klara Maas, their granddaughter and the daughter of Jakob Maas and Rosa Goldenberg. 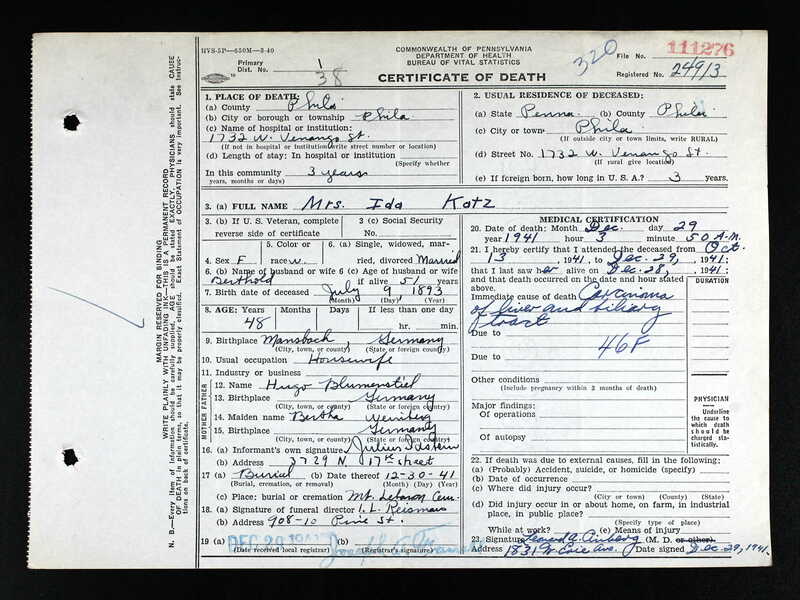 Klara arrived in the United States on May 4, 1940. 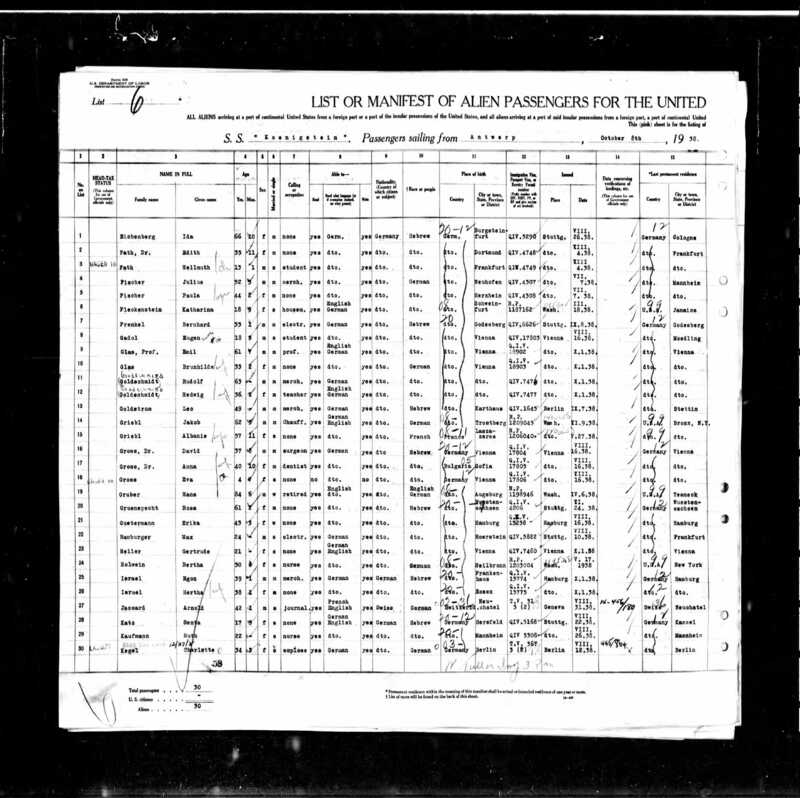 According to the ship manifest, she was going to New York City to her uncle Julius Goldenberg, brother of her mother Rosa and her uncle Nathan Goldenberg. 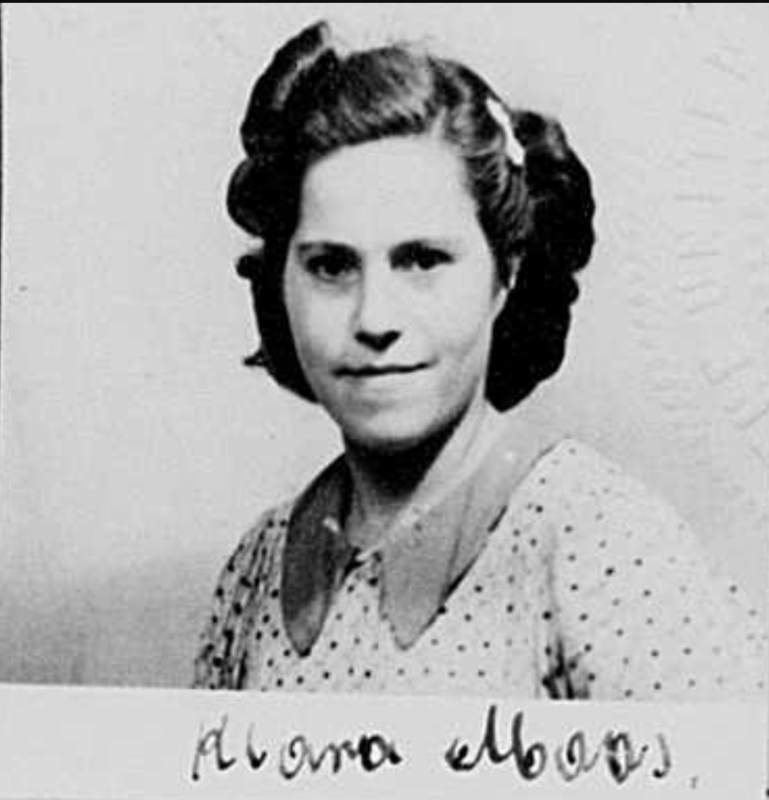 On April 9, 1941, Klara filed a Declaration of Intention to become a US citizen; she was working as a houseworker at the time and living in Forest Hills, New York. She was not yet twenty years old. 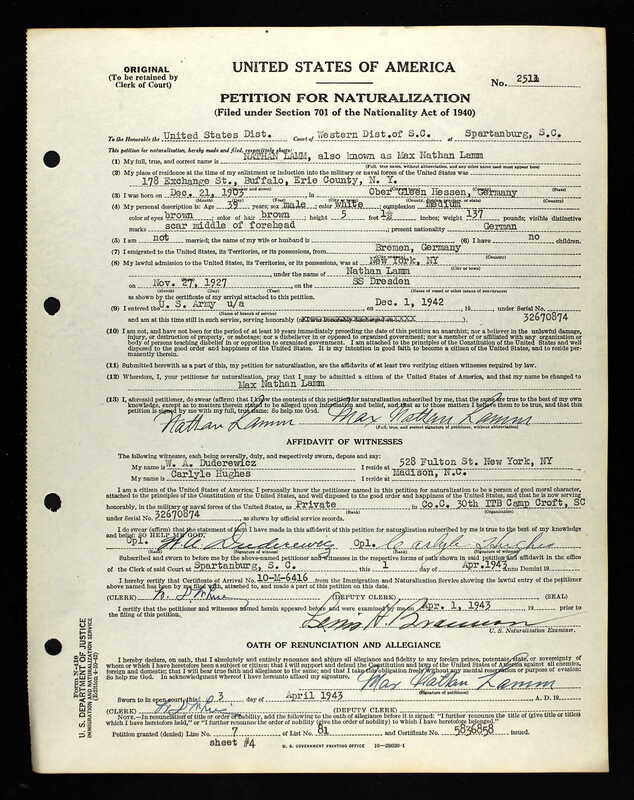 On August 2, 1945, Klara petitioned for naturalization; at that time she was working as a nursemaid and living back in Manhattan on Fort Washington Avenue. 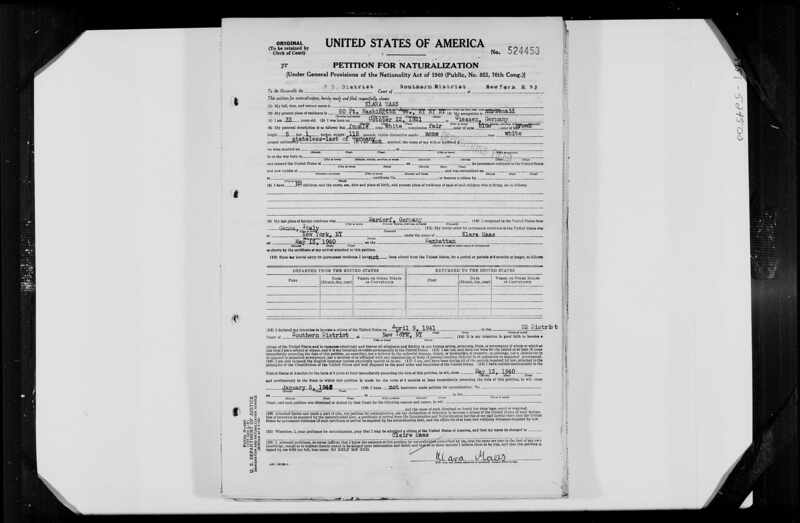 Her petition was supported by statements from two people, including Liselotte Goldenberg, the wife of Klara’s uncle Julius Goldenberg, who was also living on Fort Washington Avenue although at a different house number. Klara was sworn in as a US citizen on February 18, 1946. After that, I lost track of her. In 1946 she would have been 25 years old. If she married after that, I could not find her in the NYC marriage index or elsewhere. But then I went back to look at the documents I had to see if there were any clues I’d missed. And there was one: when she’d petitioned for naturalization, she’d petitioned to change her name from Klara to Claire. I really didn’t think that this would make a difference in my search results since I knew that in my searches for Klara on both Ancestry and FamilySearch the search engines picked up women named Clara and Claire as well. But I figured, what the heck, let’s search for Claire Maas. And this time Ancestry turned up something new, something important. 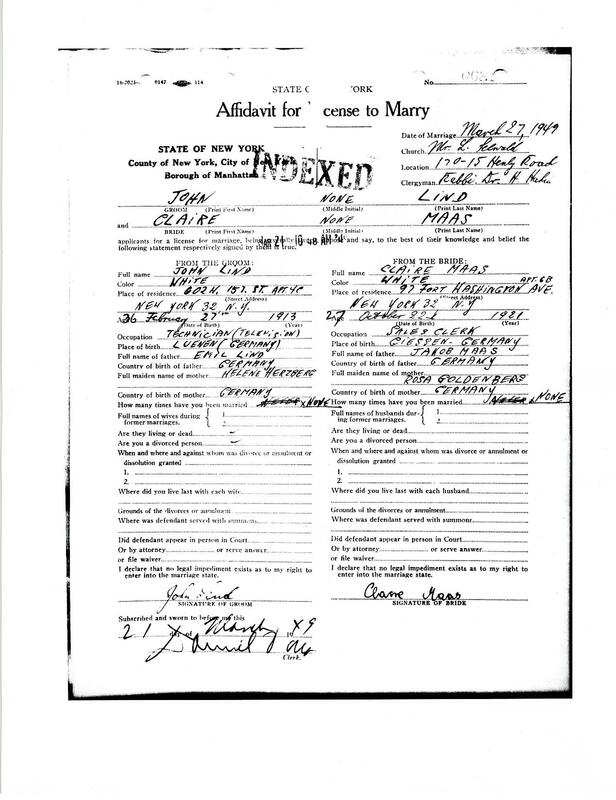 It was an entry in the New York City Marriage License Index, 1907-1995, database that indicated that a Claire Maas had married a John Lind on March 21, 1949. Could it be my cousin Klara? I wasn’t sure. I had the names, date, and license number, so I contacted Allan Jordan, who generously offers to retrieve NYC documents for just his travel costs and the cost of the document. He said he hoped to get to the Clerk’s Office in the next week. While waiting for the marriage license file, I spent hours and hours searching for John Lind, Claire Lind, Claire Maas, and any other combinations I could dream up on newspapers.com, GenealogyBank.com, Ancestry, FamilySearch, and Google. And the only real clue I came up with was a 2015 story about a group of senior citizens living in a Jewish nursing home in New Jersey who called themselves the Senior Jax Pack because they had become avid fans of a contestant on American Idol known as Jax. One of the women in the Senior Jax Pack was named Claire Lind. She was 93 years old, and the article stated that she had escaped from “pre-war Germany as a child.” Klara Maas would have been almost 94 in 2015, and she had been a teenager when she left Germany in 1940. Could this be my Klara Maas? I wasn’t sure, and the article gave no more details except to mention that Claire Lind had recently passed away. I found an obituary for Claire Lind, who died on July 29, 2015, but it did not provide her birth name, her birth date, or the names of her spouse or survivors. I called the cemetery where she was buried and learned that she must have been the Claire Lind who married John Lind because he is also buried there. I found a few other articles about the Senior Jax Pack that mentioned Claire Lind, but they also did not reveal any additional information about Claire’s identity. And so I waited for Allan to send me the marriage license documents. While I waited, I watched the videos of Claire Lind from the first article I’d found and fell in love with her, hoping she would prove to be my cousin. Listen to her sing in the first one, and listen to her advice to Jax in the second. 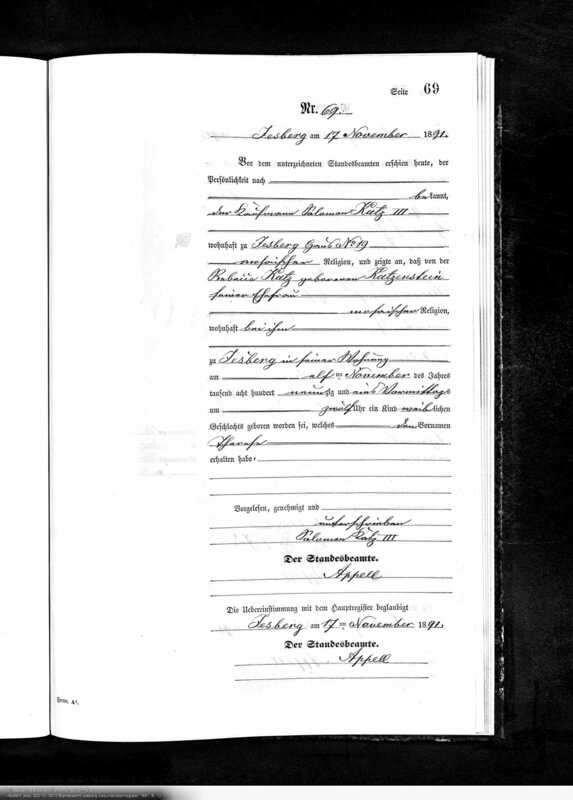 There it was—Claire Maas Lind was the daughter of Jakob Maas and Rosa Goldenberg. She was born in Giessen, Germany on October 22, 1921. The woman who had married John Lind was my cousin; my cousin Klara/Claire Maas Lind was the woman who at age 93 was a member of the Senior Jax Pack. A little research into John Lind revealed that he also had been a recent German refugee when he married Claire Maas in 1949. He was born Hans Levi in Luenen, Germany on February 27, 1913, and was the son of Emil Levi and Helen Herzberg (the family had changed its surname from Levi to Lind after arriving in the US). He died in 1977. And so Klara Maas, whose parents had been murdered in the Holocaust, making her the sole surviving descendant of Johanna Katzenstein and Simon Maas, had lived a full life in the US. She became Claire Lind—singing into the last days of her life despite the heartbreak she must have experienced as a young woman. I am so glad I found her story. I will now return to the children of Jakob Katzenstein and Sarchen Lion. I had already discussed their first two children and their descendants: Gelle and Mina. Mina Katzenstein’s children and descendants were remarkably fortunate in many ways. They survived the Holocaust by escaping from Germany during the 1930s. Some went to the United States, some to South America, and some to South Africa. I don’t mean to say they were lucky. They were all torn from their homes and all that they knew and undoubtedly subjected to harassment and discrimination before they left and some painful adjustments after they left. But they did survive. As we’ve seen, that was not true for many of the descendants of Mina’s sibling Gelle. Now we can explore the fate of the other seven children of Jakob Katzenstein and Sarchen Lion. Unfortunately, many of them do not have happy endings. 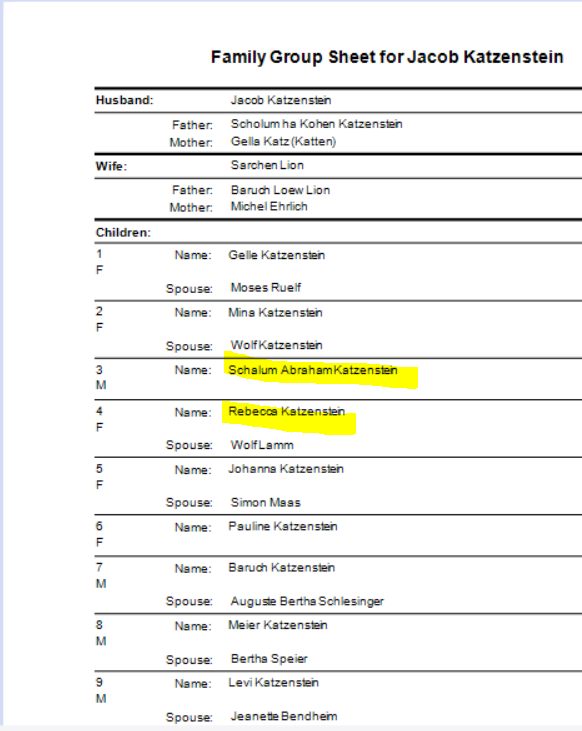 The third child of my great-great-grandfather’s brother Jakob Katzenstein and his wife Sarchen Lion was their first son, Schalum Abraham Katzenstein, named for his grandfather, Jakob’s father and my three-times great-grandfather, Scholem Katzenstein. 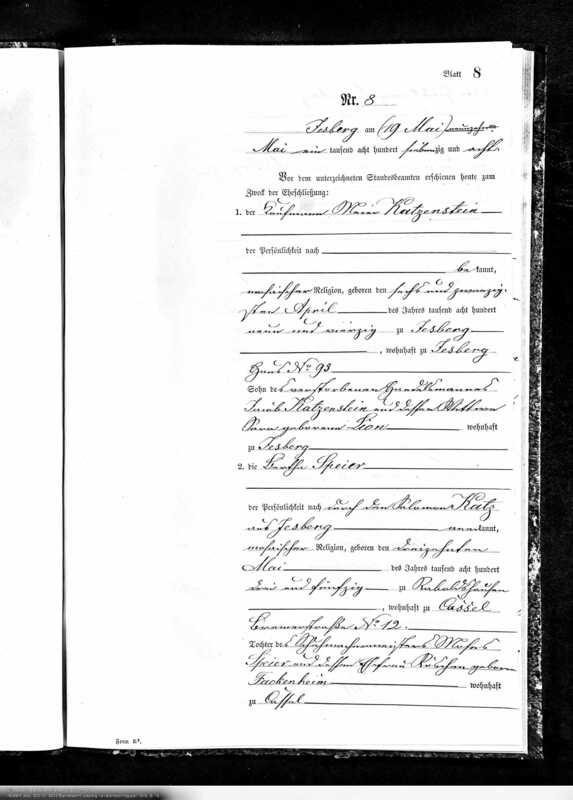 Jakob and Sarchen’s son Schalum was born in February, 1834, in Jesberg, according to the report of Reverend Bach provided to me by Barbara Greve. 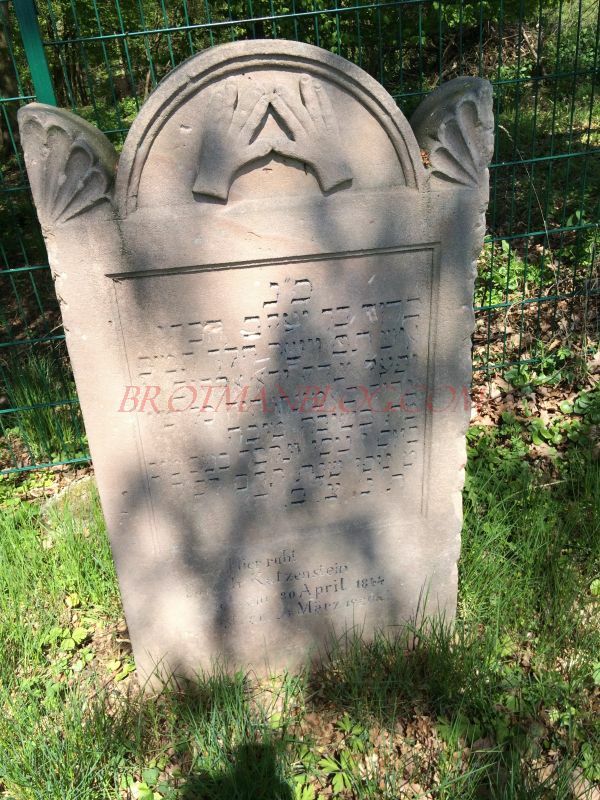 The inscription was very faded, but it had been transcribed years ago on the LAGIS site from Hebrew to German, and Barbara Greve translated the German translation of inscription on the headstone for me into English. It describes Schalum as “a lovable youth of a beautiful stature who avoided evil and was attached to the good. He was quick and nimble in his work in the short time of his work. And there came death, and gathered him there in the blossom of his youth.” How bittersweet. Jakob and Sarchen’s fourth child was Rebecca Katzenstein. According to her death certificate and the report of Reverend Bach, Rebecca was born on July 6, 1836. 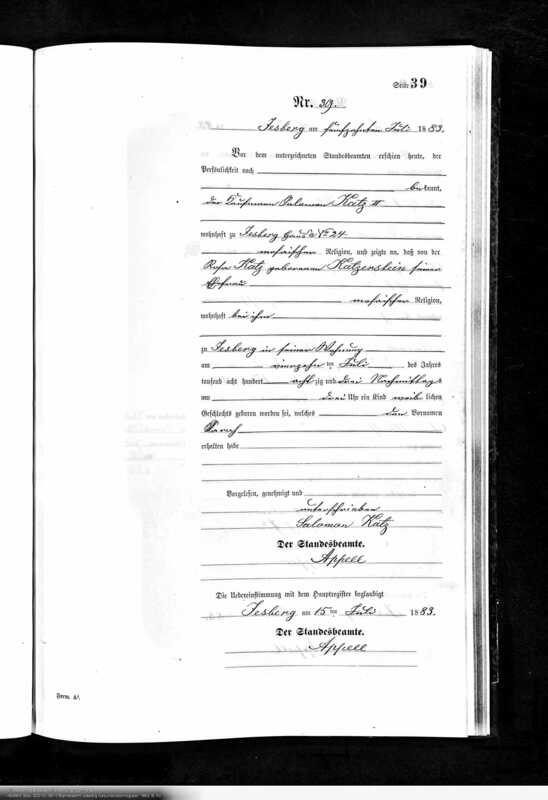 I was not able to locate a marriage record for Rebecca, but sometime before August, 1866, Rebecca married Wolf Lamm of Ober-Gleen, Germany. According to his death record, Wolf was the son of Joseph Lamm and Hanna Goldschmidt and was born in Ober-Glenn in about 1833. 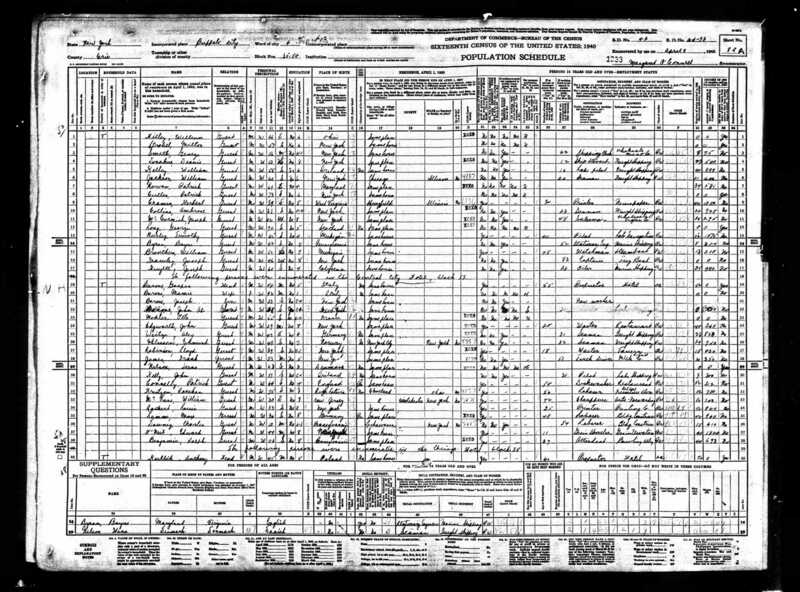 Rebecca and Wolf had two children, Karoline, born August 4, 1866, in Ober-Gleen, and Joseph (obviously named for his paternal grandfather), born July 9, 1870, in Ober-Gleen. Wolf died before either of his children married. He died on March 13, 1897, in Ober-Gleen. He was 64 years old. Their daughter Karoline married Seligmann Hoexter on March 3, 1908, in Ober-Gleen; he was born February 7, 1858, in Gemuenden, Germany, and had been previously married and widowed. Karoline was 41 when she married Seligmann, and he was fifty. They did not have any children. 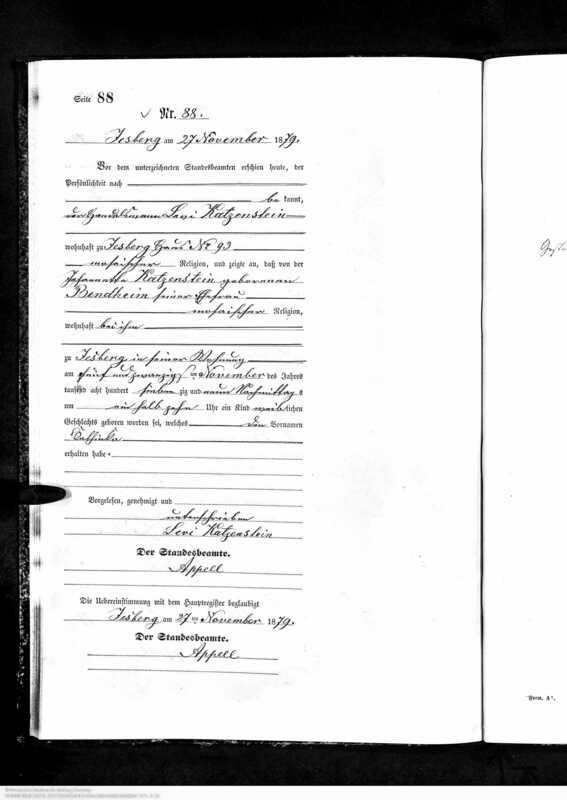 Joseph Lamm, Karoline’s brother, married Bertha Baum on November 24, 1901. Bertha was born June 10, 1877, in Gielhausen, daughter of Abraham Baum and Gretchen Kaiser. Joseph and Bertha had two sons, Willi, born November 15, 1902, in Ober-Gleen, and Nathan, born December 21, 1903, also in Ober-Gleen. Rebecca Katzenstein Lamm lived to see her children marry and her two grandsons born. She died on February 20, 1915, in Ober-Gleen at age 74. Just three years later, Rebecca’s daughter Karoline died on January 11, 1918, making her husband Seligmann a widower for the second time. Karoline was only 51 years old. Seligmann Hoexter died twenty years later on October 12, 1938. 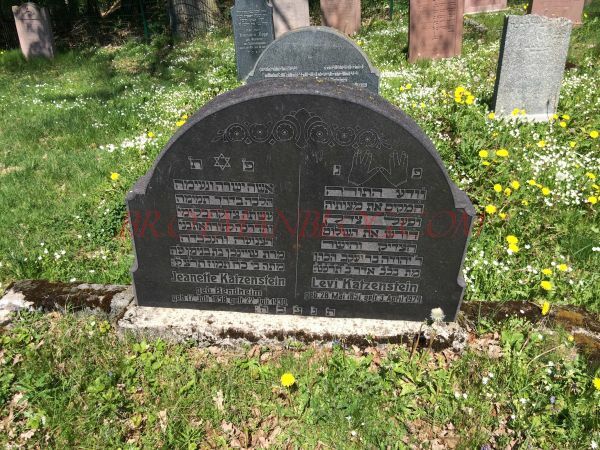 He was eighty years old and died at the Jewish community hospital in Frankfurt. Unfortunately, all but one of the remaining family members were killed in the Holocaust. 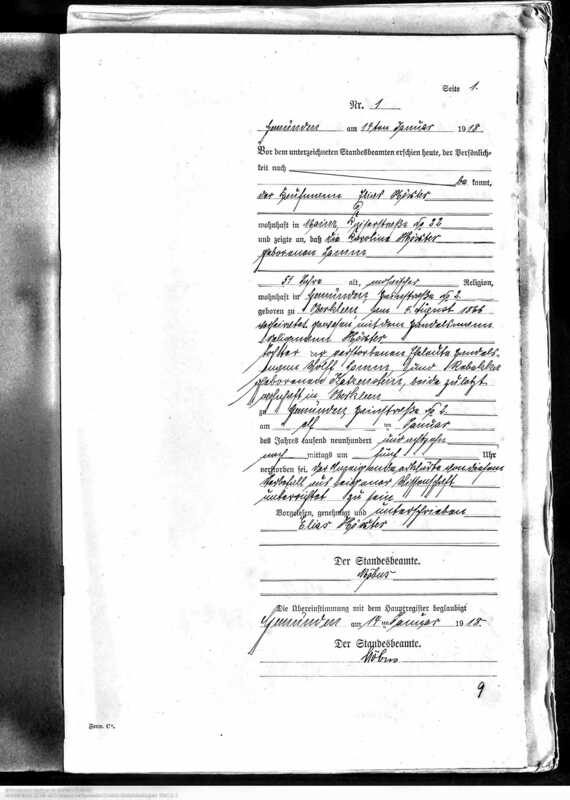 Joseph Lamm and his wife Bertha Baum Lamm were deported first to Theriesenstadt on September 1, 1942. 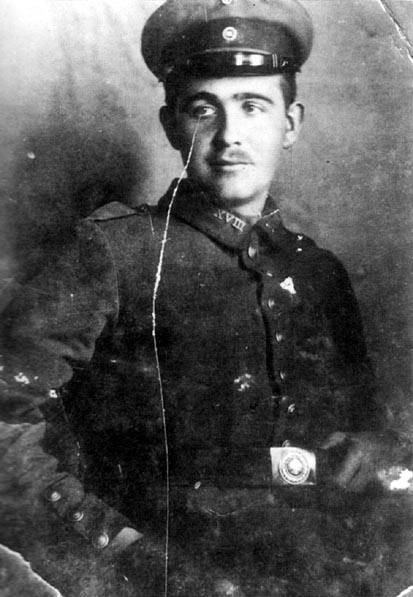 Joseph was then taken to Treblinka, where he was murdered on September 29, 1942. Bertha died at Theriesenstadt on December 17, 1942. The only descendant of Rebecca Katzenstein and Wolf Lamm to survive the Holocaust was their younger grandson, Nathan, Willi’s brother. Nathan had left Germany before Hitler even came to power. He had arrived in New York on November 27, 1927, reporting that he was a tailor and that he was going to a friend in Buffalo named Henry Geissler, who had been in the US since 1923 and was also from Ober-Gleen. In 1940, Max Lamm was still in Buffalo, living in a large guest house and working as a laborer in building construction. 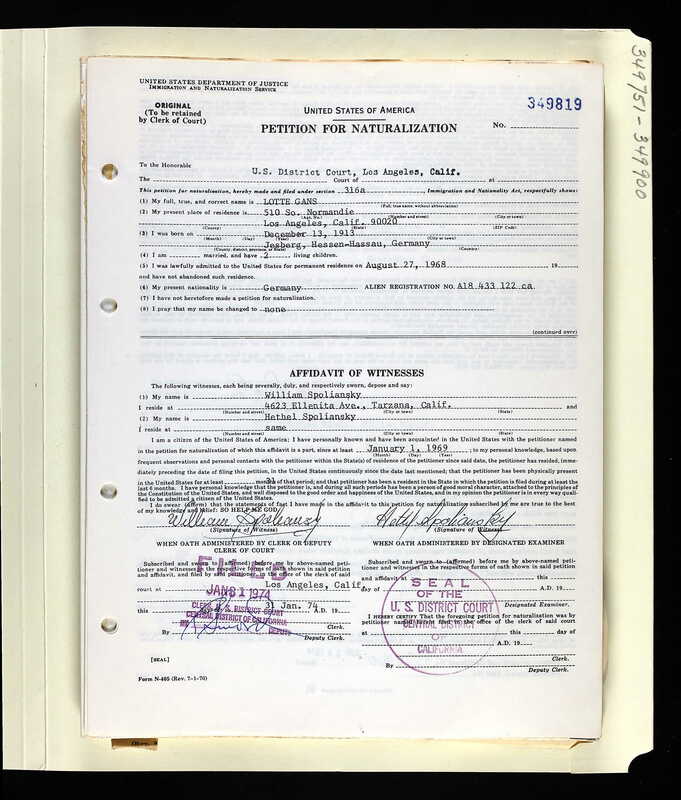 He enlisted in the US Army on December 1, 1942, and while in the army, he petitioned for citizenship, as the document above reveals. He was apparently stationed in South Carolina when he filed his petition. After serving in the military for the United States during World War II, Max Nathan Lamm returned to Buffalo, New York; he is listed in Buffalo directories for 1957 and 1960, working as an employee of the Red Star Express, a trucking company. 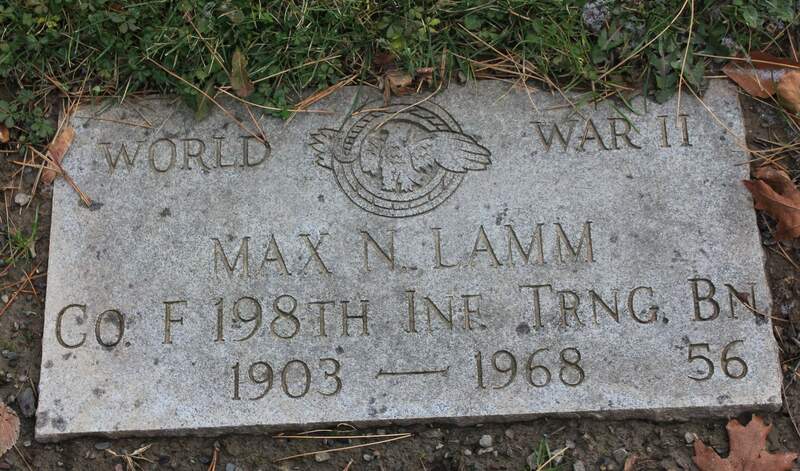 Max Nathan Lamm died in 1968 and is buried at Forest Lawn Cemetery in Buffalo. He was 64 years old. It does not appear that he ever married or had children, and he had lost his brother and both his parents during the Holocaust. He was the only surviving descendant of Rebecca Katzenstein and Wolf Lamm, and he died without survivors. Thus, neither Schalum or Rebecca Katzenstein has any living descendants. The fifth child of Jakob Katzenstein and Sarchen Lion was their daughter Johanna. Her story is covered in my next post. The last two children of Mina Katzenstein and Wolf Katzenstein were Rebekka and Regina, and because their fates are intertwined in several ways, I will discuss both in this post. Rebekka was born on August 28, 1865, in Frankenau. Regina was born two years later on September 24, 1867. Rebekka married her cousin Salomon Schalom Kneibel Katz (apparently known as Kneibel) on April 30, 1889, as discussed previously. 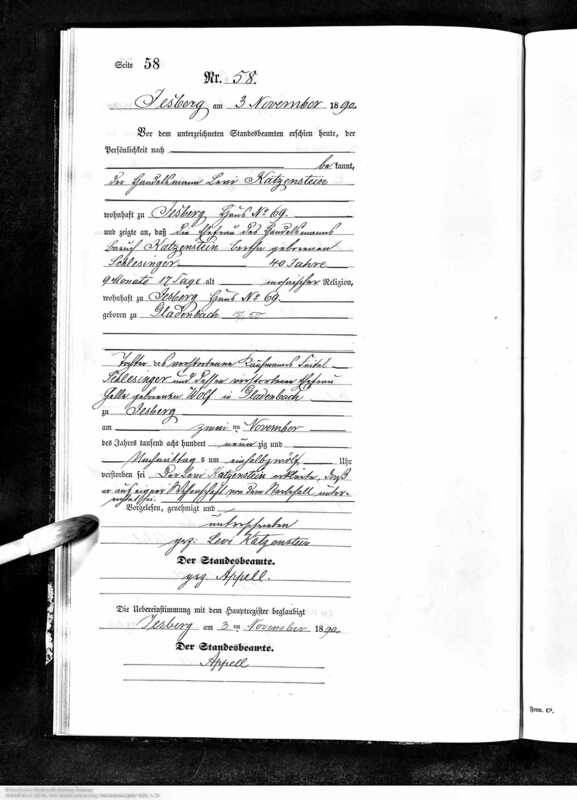 Two and a half years later, on November 25, 1891, Regina Katzenstein married Selig(mann) Alexander in Frankenau. He was born on September 20, 1861, in Momberg, the son of Joseph Alexander and Fradchen Frank. Rebekka and Salomon Kneibel Katz had four children, three sons and one daughter. 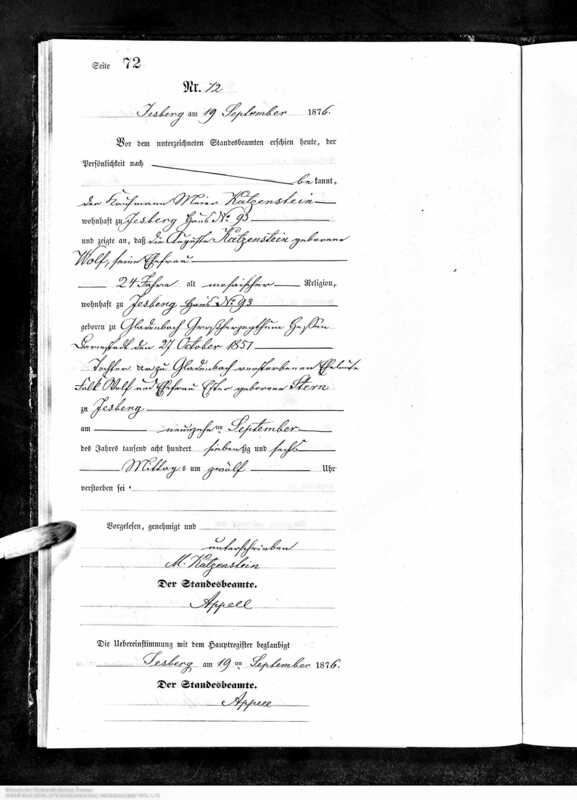 Their first child was Berthold; he was born on May 15, 1890, in Jesberg. Then came Rebekka and Salomon’s only daughter, Therese. She was born November 11, 1891, in Jesberg. Two sons followed Therese. Julius was born May 30, 1893, in Jesberg. And Jakob Katz was born April 14, 1895, in Jesberg. Meanwhile, Regina and her husband Selig Alexander were also having children in the 1890s. Regina gave birth to seven children, but only four survived infancy. The first child, a girl, was stillborn on January 9, 1893. Less than a year later, Regina gave birth to Bertha on December 28, 1893, in Momberg. Regina and Selig’s third child was Rosa. She was born in Momberg on January 18, 1896. 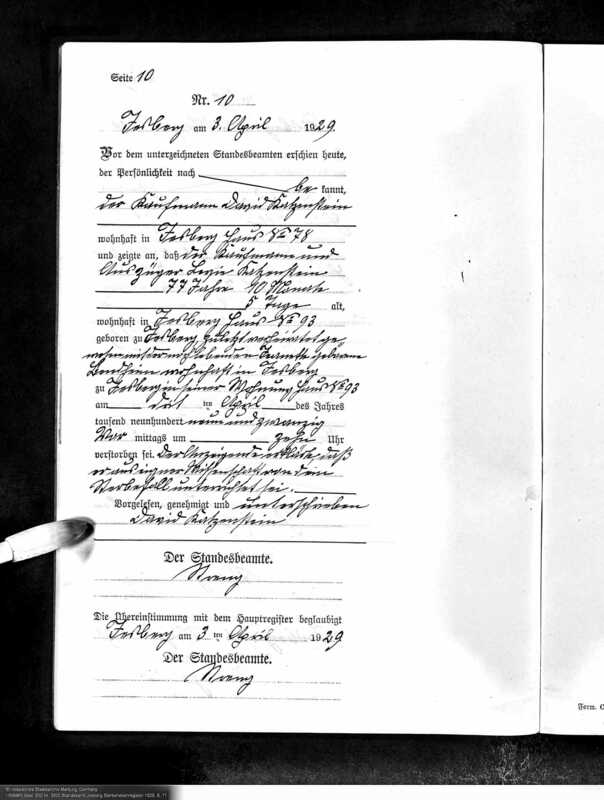 Almost two years after Rosa’s birth, on December 22, 1897, Regina gave birth to her fourth child, Mina, named for Regina’s mother Mina Katzenstein, who had died on September 5, 1896. After giving birth to Mina, Regina and Selig lost two sons in infancy. Little Joseph Alexander lived only thirteen days, dying on January 24, 1902. His brother Manus lived for two months, dying on March 23, 1903. The seventh and last child I have for Regina Katzenstein and Selig Alexander was a son named Samuel, born January 1, 1906, according to a source provided by Barbara Greve, Barbara Haendler-Lachmann’s Schicksale der Juden im alten Landkreis Marburg 1933-1945, Hitzeroth, Marburg 1992, p. 125. Without Barbara Greve’s help, I never would have known about this seventh child as there was no available birth record for him online. Thus, of the seven children born to Regina and Selig Alexander, only Bertha, Rosa, Mina, and Samuel lived to adulthood. In many ways the two Katzenstein sisters were following similar paths at the same time, Rebekka in Jesberg, Regina in Momberg, fifteen miles apart. Their lives became even more intertwined on August 21, 1923, when Rebekka’s son Jakob married Regina’s daughter Rosa. That is, Rosa Alexander married her first cousin, Jakob Katz. They had three daughters who were not only sisters but also second cousins to each other. Rebekka and Regina shared granddaughters who were also their great-nieces. Remember also that Rebekka and her husband Salomon Kneibel were also cousins to each other, so Salomon Kneibel was not only his children’s father but also their cousin and the same for Rebekka. As for Rebekka and Regina’s other children, they made my life easier by marrying outside of the family. The first to marry was Rebekka’s daughter Therese. On June 16, 1919, she married Hermann Blum, who was born in Kuelsheim on July 7, 1883, son of Abraham and Sophie Blum. I have not been able to identify any children born to Therese and Hermann. Rebekka’s oldest son Berthold married Ida Blumenstiel on January 20, 1920. Ida was the daughter of Hugo Blumenstiel and Bertha Weinberg of Mansbach, Germany. She was born July 9, 1893. 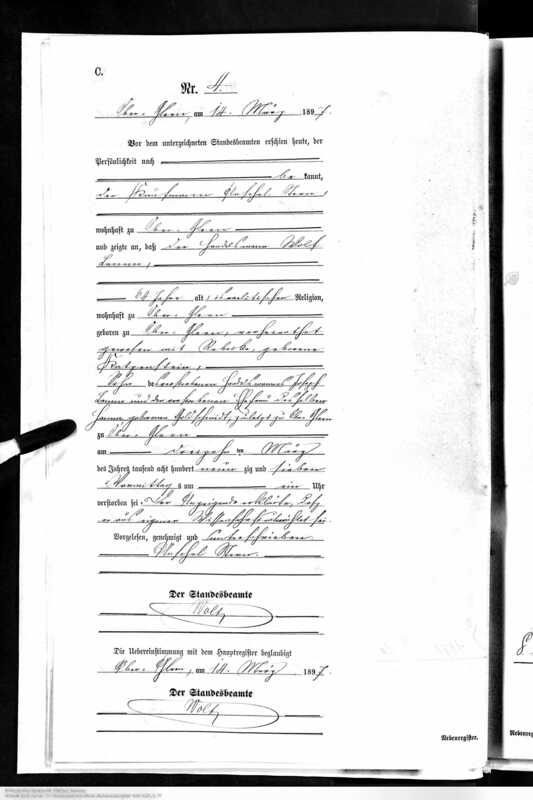 Berthold and Ida would have two children born in the 1920s, Senta (1921) and Ludwig (1924). 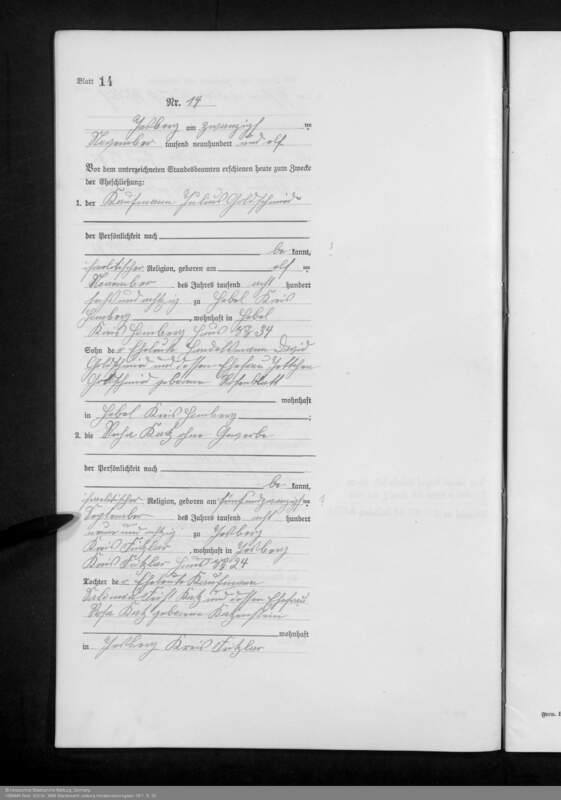 I have not found any marriage record for Rebekka’s son Julius, and, as discussed above, her son Jakob married his cousin Rosa on August 21, 1923, and they had three daughters. 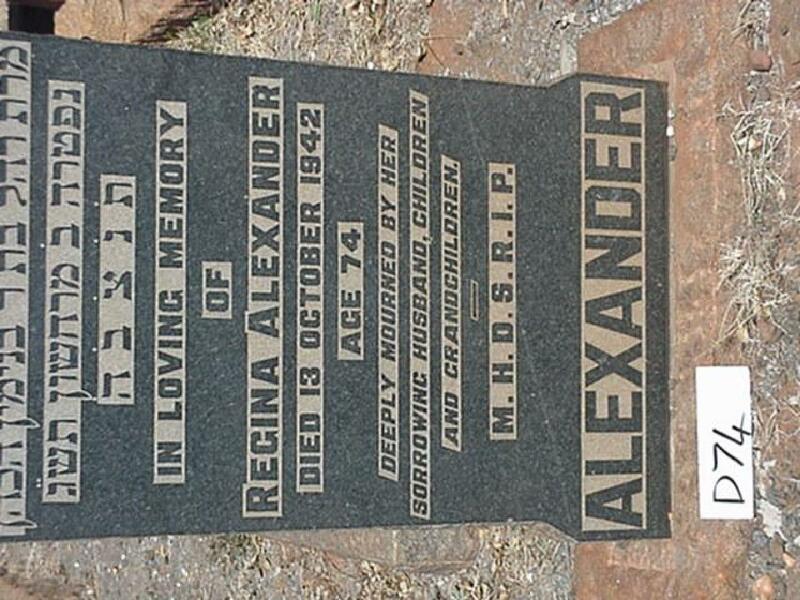 As for Regina’s children, Bertha Alexander married Julius Simon on June 26, 1922, in Momberg. He was the son of Moses Simon and Fanni Katz and was born in Pohl-Goens on May 29, 1891. I have not been able to locate any record of children born to Bertha and Julius, nor do I have any records for them after their marriage, but I am still looking. Thank you to Aaron Knappstein for finding this photograph of Julius Simon on the Vor dem Holocaust – Fotos zum jüdischen Alltagsleben in Hessen website. According to the website, this was taken in 1916 when Julius was a soldier in the Germany army during World War I.
I am still hoping to locate some records that will reveal what happened to Julius Simon and Bertha Alexander. Bertha’s younger sister Rosa Alexander married Jakob Katz, as discussed above. The third sister Mina Alexander married Leo Wachenheimer in Momberg on December 25, 1927. Leo was the son of Meier Wachenheimer and Klara Rothschild; he was born on March 23, 1897, in Biebesheim, Germany. Mina and Leo would have two children. 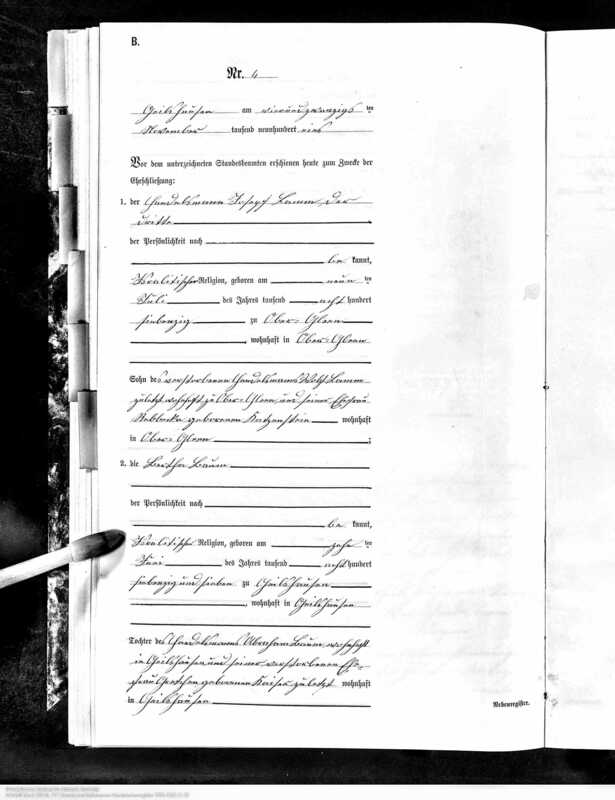 According to Barbara Greve, Regina and Seligmann’s only surviving son, Samuel, married Lottie Weiler in July 1933; Lottie was born in Marburg on January 10, 1913, according to the JOWBR. I do not have names for her parents. Samuel and Lottie had one son, Hans-Joseph Alexander, according to Barbara Greve. 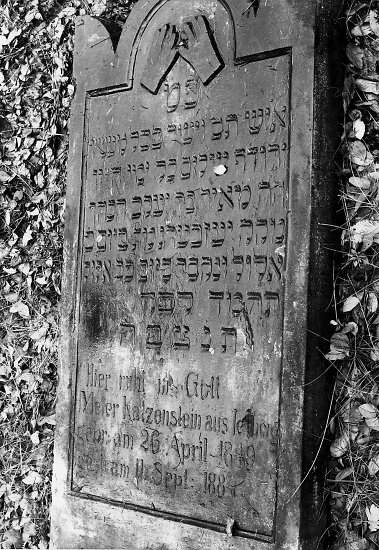 Rebekka Katzenstein Katz died in Jesberg on March 2, 1927; she was only 61 years old. Her husband Salomon Scholum Kneibel Katz died two years later on May 2, 1929. He was 69. The rest of the families of Rebekka and Regina Katzenstein survived into the Nazi era, and it appears that every single one of them left Germany in time—all of Rebekka and Salomon Kneibel’s children and spouses and grandchildren as well as Regina Katzenstein and Selig Alexander and at least three of their four children and spouses and grandchildren. The only couple I’ve been unable to find in any later record or index are Regina’s daughter Bertha and her husband Julius Simon. 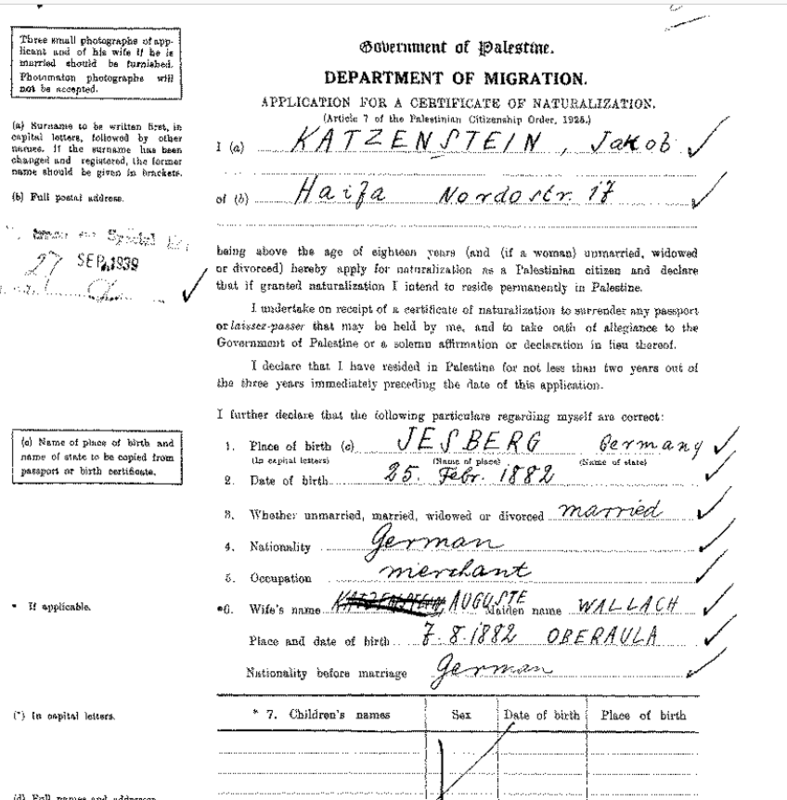 Almost all the rest of the families of Rebekka Katzenstein and her sister Regina Katzenstein ended up in Johannesburg, South Africa. Unfortunately, I don’t have any actual records or documents that reveal when the family arrived there or any other information aside from their deaths and burials. 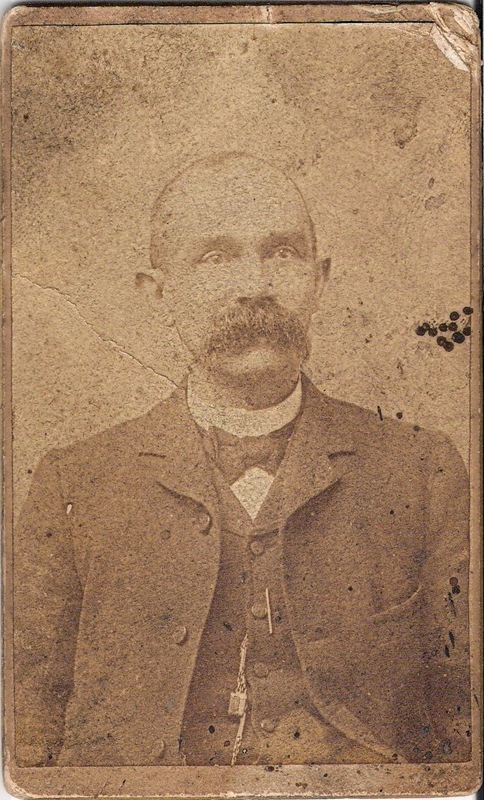 But I was fortunate to connect with John Leach, a relative by marriage of Leo Wachenheimer, husband of Mina Alexander. From John I learned that Leo had been a cattle dealer in Germany and had also worked in his father’s kosher butcher business. Leo was arrested by the Nazis in 1935 for doing business with a non-Jew; when he was released, he escaped from Germany to South Africa, where he opened a kosher butcher shop. Soon many family members followed him, including his wife Mina and their children, his in-laws Regina and Selig Alexander, his sister-in-law Rosa Alexander Katz and her husband Jakob Katz and their three children, and Jakob Katz’s sister Therese Katz and her husband Hermann Blum and Jakob’s brother Julius Katz. They all appear to have spent the rest of their lives in Johannesburg. By 1940, they had settled in Philadelphia where Berthold was working as a salesman for a paper bag company and Senta was working as a packer for a children’s dress company. Bertha’s mother-in-law Bertha Blumenstiel was also living with them. That same year Senta married Julius Idstein, who was also a refugee from Germany. 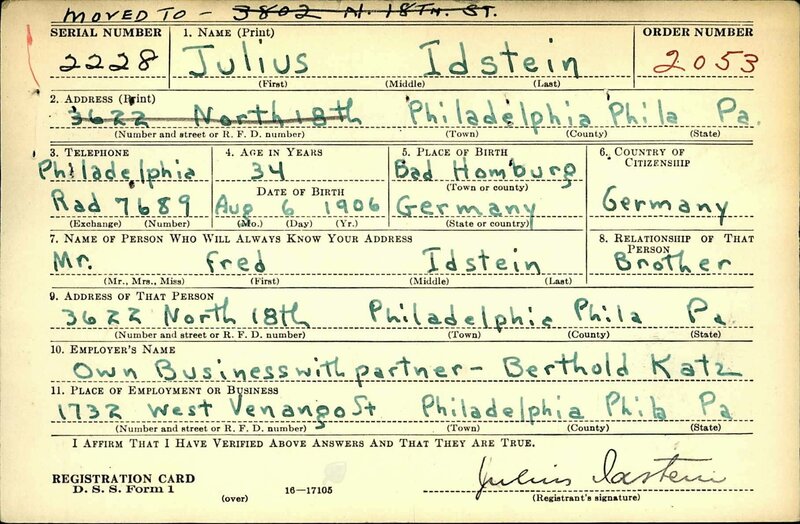 (Philadelphia, Pennsylvania, Marriage Index, 1885-1951) Julius was born on August 6, 1906, in Bad Homburg, and came to the United States on October 20, 1938. 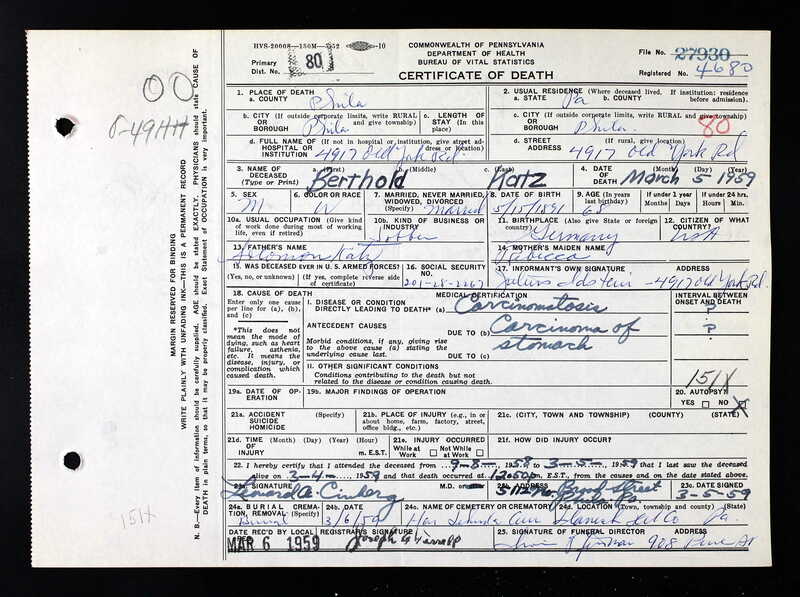 On his World War II draft registration, he reported that he was a partner in business with Berthold Katz, his father-in-law. On Berthold’s registration, he reported that he owned a paper products business. So between his arrival in 1938 and 1942, Berthold had become a business owner in partnership with his son-in-law Julius. Sadly, Berthold’s wife Ida died at age 48 of liver cancer on December 29, 1941. Berthold’s daughter Senta and her husband Julius Idstein had five children. Julius died in 1981, and Senta lived until 2003. She was 82 when she died. Berthold’s son Ludwig became a nuclear physicist and was a senior scientist for Visidyne, Inc. in Burlington, Massachusetts, when he was killed in a car accident on March 18, 1981. He was 57 years old and was survived by his wife and two children. “Ludwig Katz, Swampscott,” Boston Herald (March 25, 1981), p. 40. As for the family in South Africa, I have no information other than their dates of death and burial place. 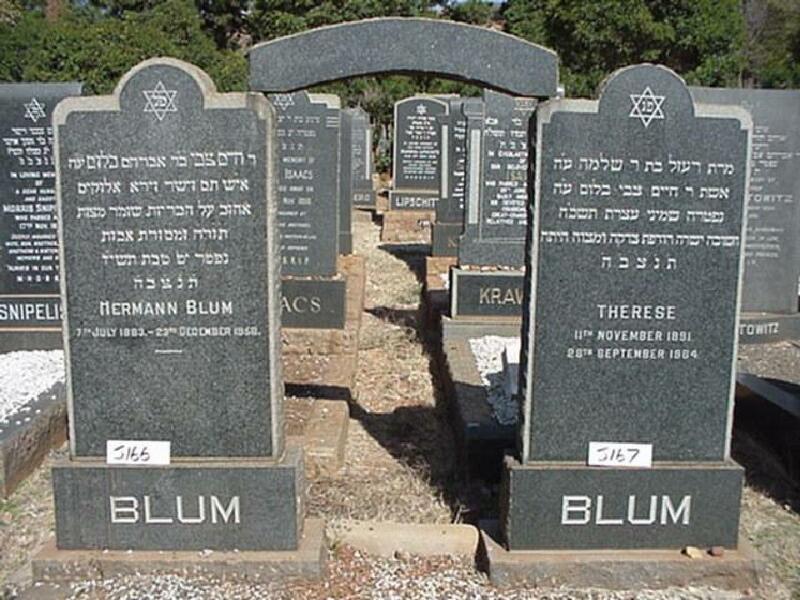 All those named below are, like Regina Katzenstein and Selig Alexander, buried at the West Park Cemetery in Johannesburg, and all this information comes from the JOWBR on Jewishgen.org and from Charmaine Rosenberg of the Chevra Kadisha in Johannesburg. I am very grateful to Charmaine for providing me with these photographs of the headstones. 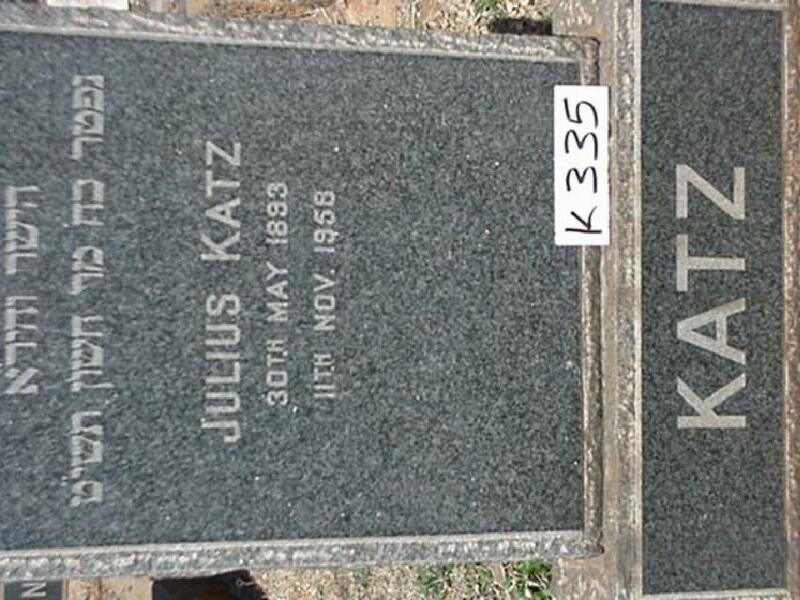 Julius Katz died on November 11, 1958, when he was 65. As far as I know, he never married or had children. Therese Katz died on September 28, 1964, eight years after her husband Hermann Blum, who died on December 23, 1956. She was 73, he was also 73 when he died. As far as I have been able to determine, they did not have children. Jakob Katz died on August 24, 1974; he was 79. His wife and first cousin Rosa Alexander Katz outlived him by 23 years. She was almost 101 when she died on June 14, 1997. Rosa’s sister Mina Alexander Wachenheimer also outlived her husband by many years. 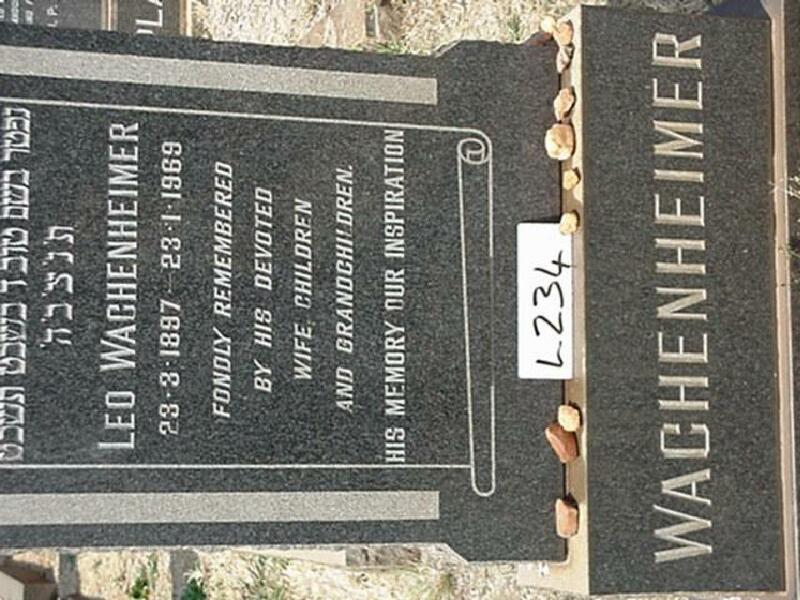 Leo Wachenheimer died on January 23, 1969, when he was 72. 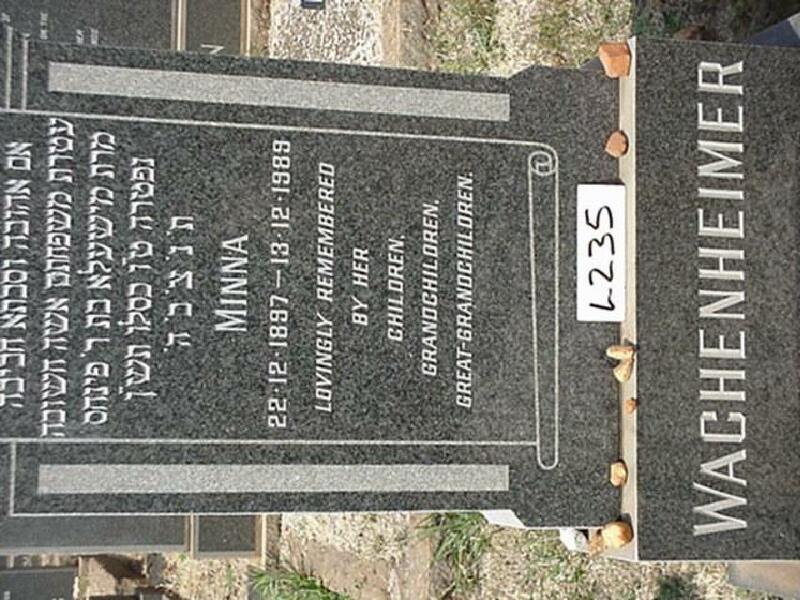 Mina survived him by over twenty years, dying on December 23, 1989, when she was 92. Samuel Alexander died on June 21, 1989; he was 83. He had outlived his wife Lotte by seventeen years; she died on January 11, 1972, when she was 59. Overall, the children of both Rebekka and Regina Katzenstein, daughters of Mina Katzenstein and Wolf Katzenstein, were fortunate to escape from Nazi Germany when they did. Perhaps Leo Wachenheimer’s arrest in 1935 was the key that opened the door to the survival of all of them. The Brick Wall Surrounding Rosa Katzenstein: Help Wanted! The story of Rosa Katzenstein is largely unrevealed, and I sure could use some help. 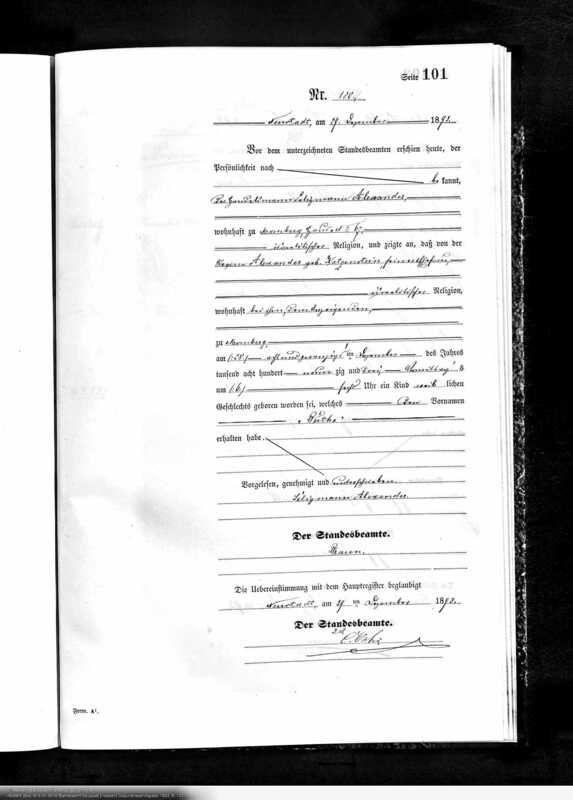 Rosa was the oldest child of Mina and Wolf Katzenstein, born on June 19, 1859, in Frankenau, Germany, and as I wrote last time, she married her third cousin, once removed, Salomon Feist Katz, son of Joseph Feist Katz and Brendel Katz of Jesberg. 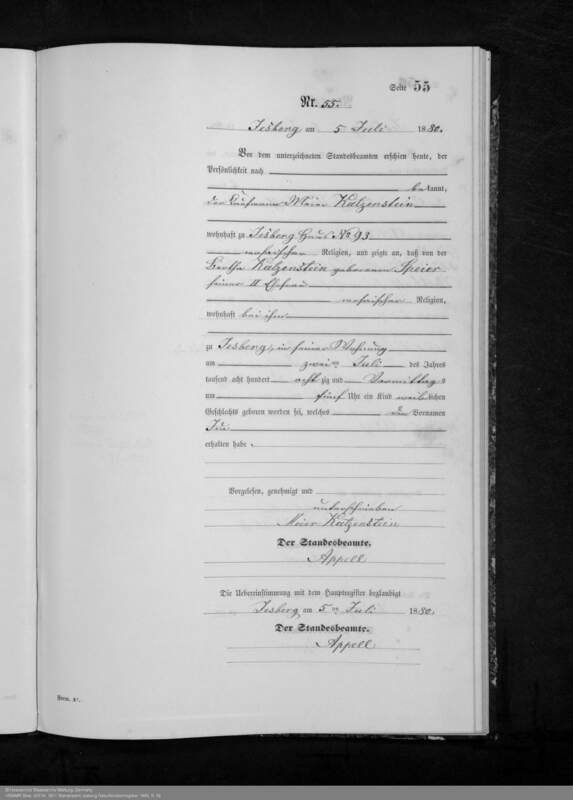 Rosa and Salomon were married on June 28, 1881, in Jesberg. Rosa and Salomon had four daughters. The first, Zilli, was born on May 22, 1882, and died just two and a half months later on August 4, 1882. The second daughter, Sarah, was born a year later in Jesberg on July 14, 1883. She married Otto Loew on October 28, 1904, in Jesberg. Otto was the son of Leopold Loew and Johanna Bickhardt of Selters, Germany. Unfortunately, that is all I know about Sara and Otto. I don’t know if they had children. I don’t know if they emigrated from Germany. I don’t know where or when they died. They are not in the Yad Vashem database. They just seem to have disappeared. I searched for hypothetical children, but could find none. 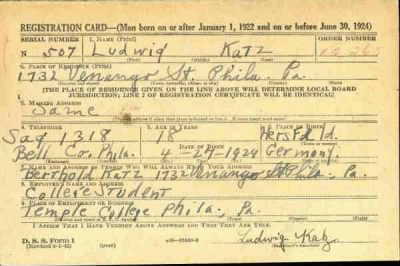 The names Sara, Katz, Otto, and Loew are so common that there was no way to determine whether any of the people with those names were my relatives, but I found nothing that would lead me to believe that they were. I did not have much better luck with Sara’s younger sister Sophie. She was born in Jesberg on July 10, 1885. 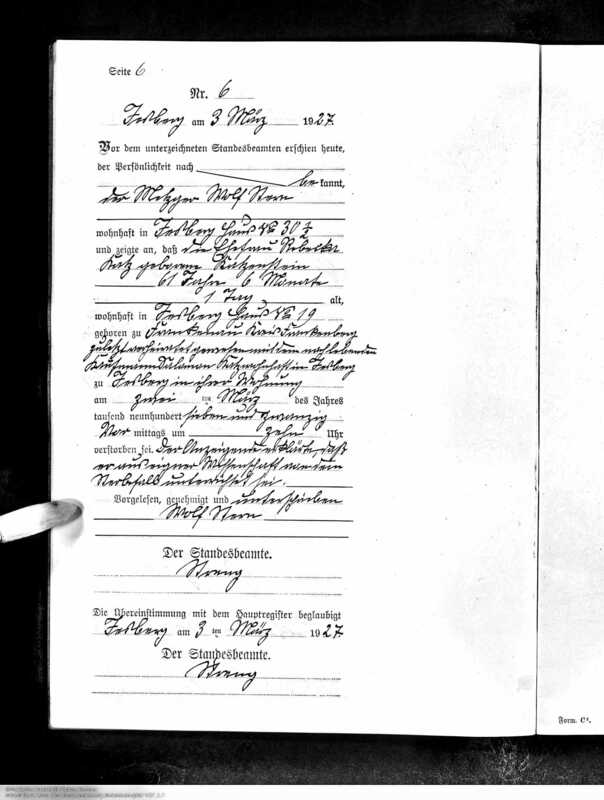 On June 9, 1909, she married Isaak Vogel in Marburg, Germany. He was born in Borken, Germany, on November 7, 1878, to Hermann Ephraim Vogel and Betti Trier. Barbara Greve told me that Sophie and Isaak had two sons, Karl, born in 1910, and Heinz, born in 1912, but I have no records for them, nor do I know what happened to Sophie, Isaak, Karl or Heinz. Once again, the names were so common that there are many people with those names, but none that matched my relatives. I had a little bit more luck with Rosa and Salomon’s youngest daughter, Recha. She was born on September 25, 1889, in Jesberg. She married Julius Goldschmidt on November 20, 1911. He was the son of David Goldschmidt and Jettchen Rosenblatt of Hebel, Germany, born on November 11, 1886. 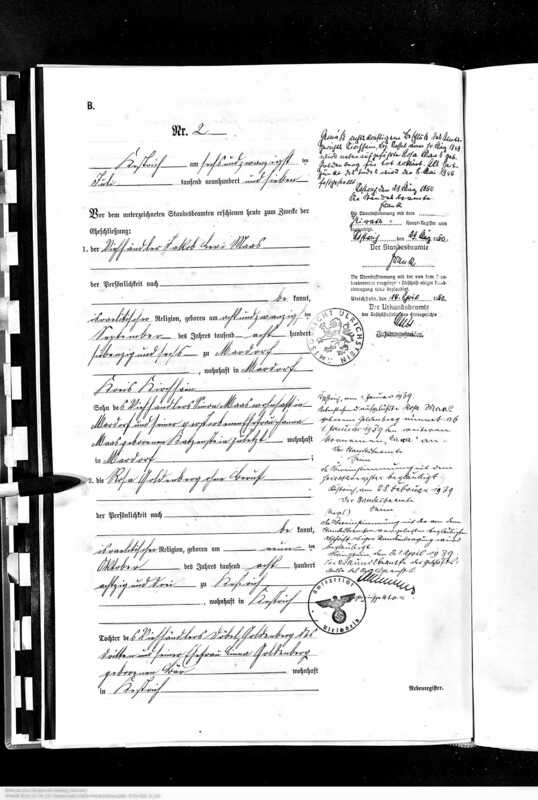 Recha Katz and Julius Goldschmidt had a daughter named Lotte born in Jesberg on December 13, 1913. 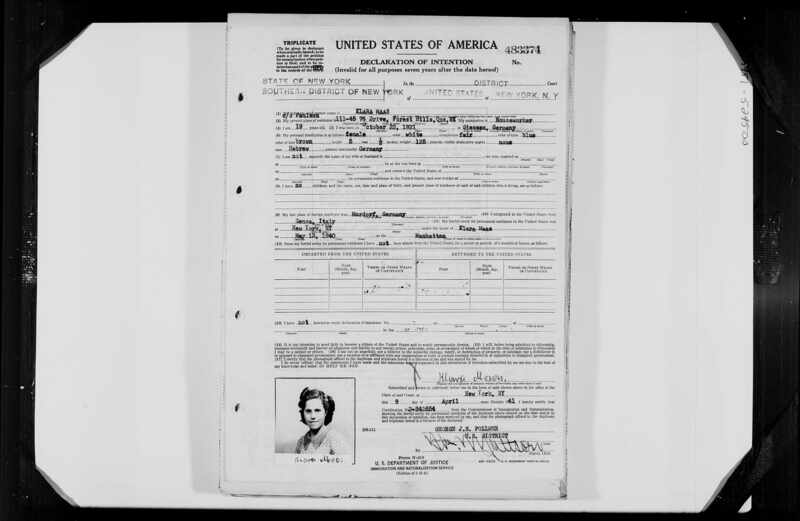 Although I could not find Lotte’s birth record, I know that Lotte was their daughter because Recha and Julius are identified as her parents on her entry in the US Social Security Applications and Claims Index. David Baron, who was in touch with Lotte’s descendants, informed me that Lotte married Julius Gans in Johannesburg, South Africa, on October 19, 1940. Eventually Lotte settled in the US where in 1974 she became a naturalized citizen. 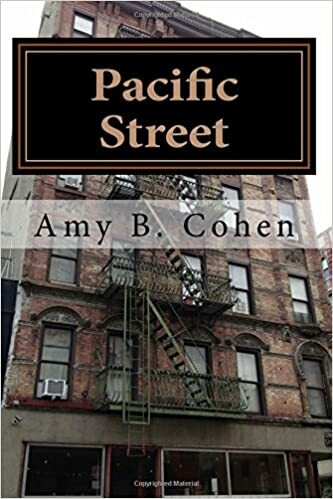 David Baron also learned from family members that Lotte’s parents both died in Buenos Aires, Argentina, Julius Goldschmidt on August 4, 1961, and Recha Katz on January 14, 1964. What had happened to the rest of the family? 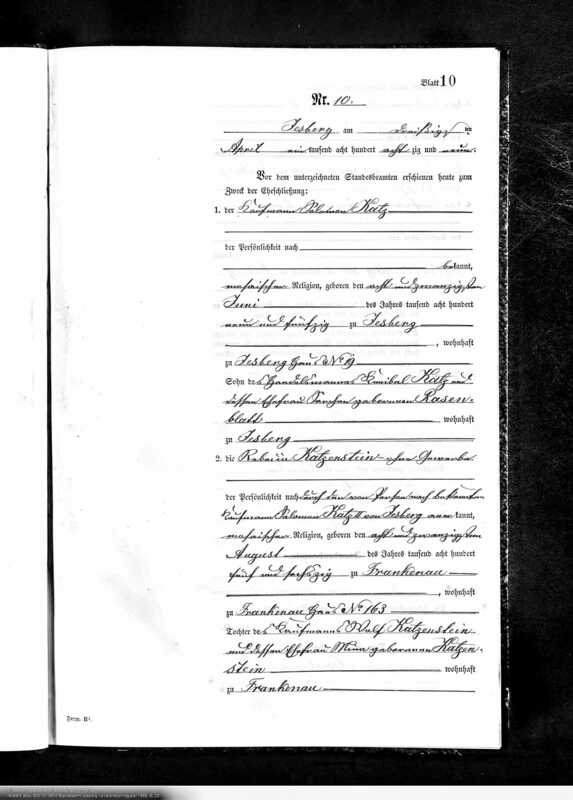 I know that Salomon Feist Katz died in Jesberg on February 16, 1924. But what had happened to Rosa and her two other daughters Sara and Sophie and their husbands? I just don’t know, and I have looked everywhere I can imagine searching. David Baron and Barbara Greve also had no information about the fates of Rosa, Sara or Sophie. If they did not find anything, perhaps there just is nothing to find. If anyone has any suggestions as to where else I might look, please let me know. UPDATE! Please see my next post for important updates to this one. I still have some work to do on two of the previously-mentioned descendants of Jakob Katzenstein’s oldest daughter Gelle and her husband Moses Ruelf, and I am working on some leads right now and should have updates soon on both Rosa Abraham Zecherman and Hugo David. But for now I am moving on to Gelle’s younger sister Mina and her descendants. 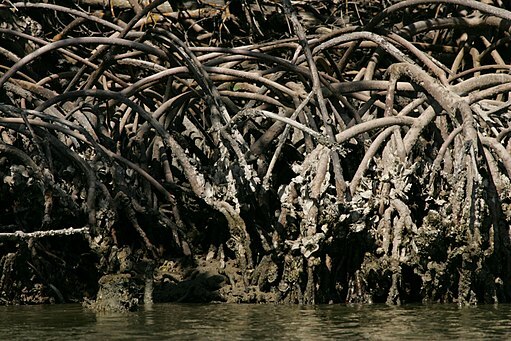 Once again, my family tree looks more like the roots of a mangrove than the usual image of a tree with outstretched and separate branches. 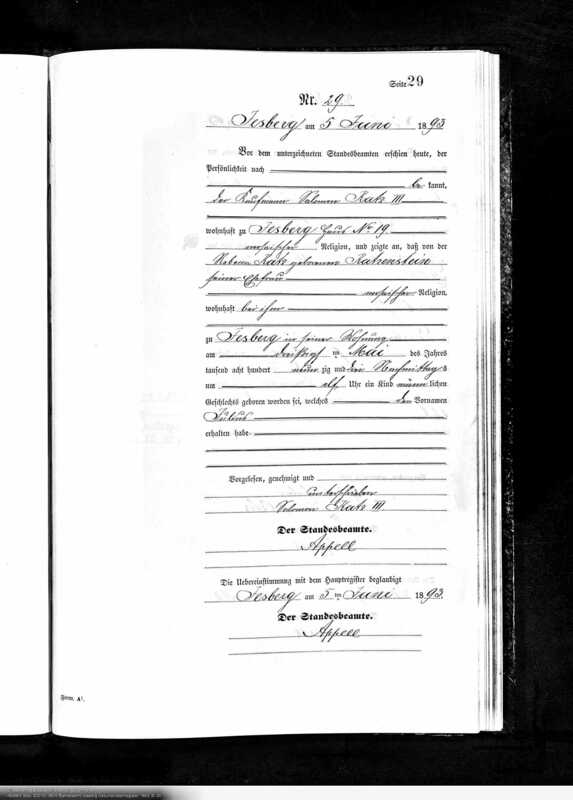 As you can see, Reverend Bach had listed their second child as Michaela with a birthdate of May 29, 1832. 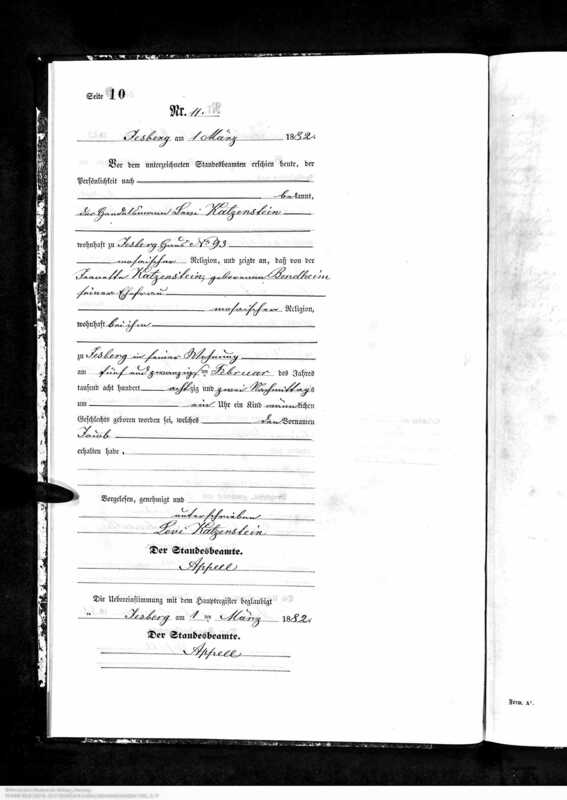 But I could not find a birth record or any record for a person with the name Michaela Katzenstein. And none of the other secondary sources for Jakob Katzenstein and Sarchen Lion listed a daughter named Michaela. 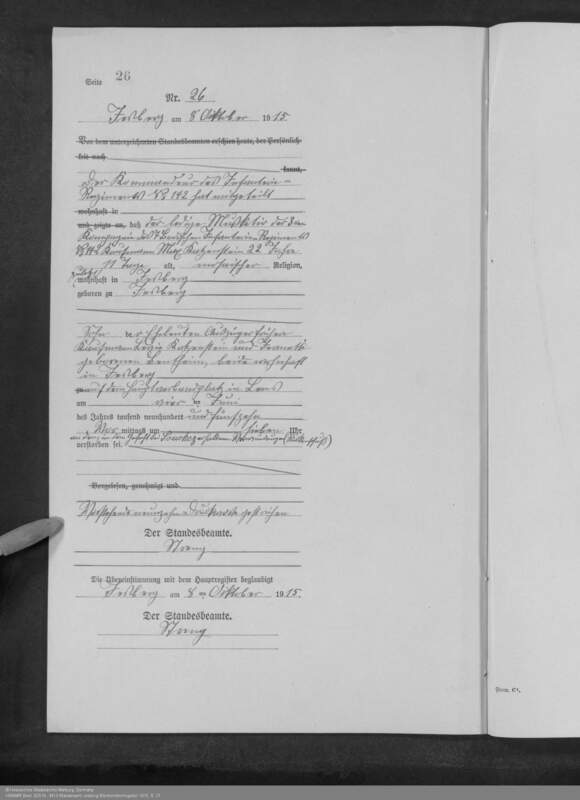 But as I was searching for Michaela on Ancestry.com, I noticed a listing of a death record for a Mina Katzenstein and decided to take a look. My gut instinct proved to be correct: Mina Katzenstein was the daughter of the merchant Jakob Katzenstein and Sarchen geb Lion. She was 64 when she died on September 5, 1896, meaning she was born in 1832, just as “Michaela” supposedly had been. I knew this had to be the same person and that her real name was Mina, not Michaela. 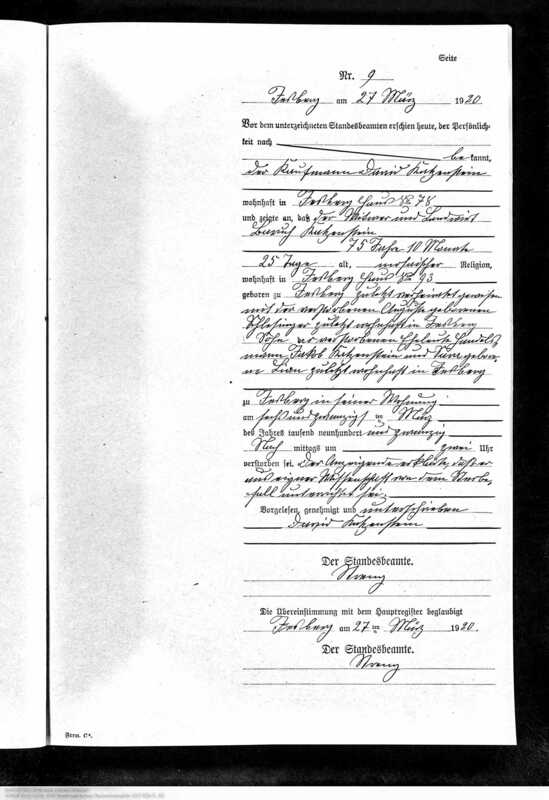 The death record also revealed that Mina was the wife of Wolf Katzenstein and that she had been living in Frankenau, Germany, at the time of her death. 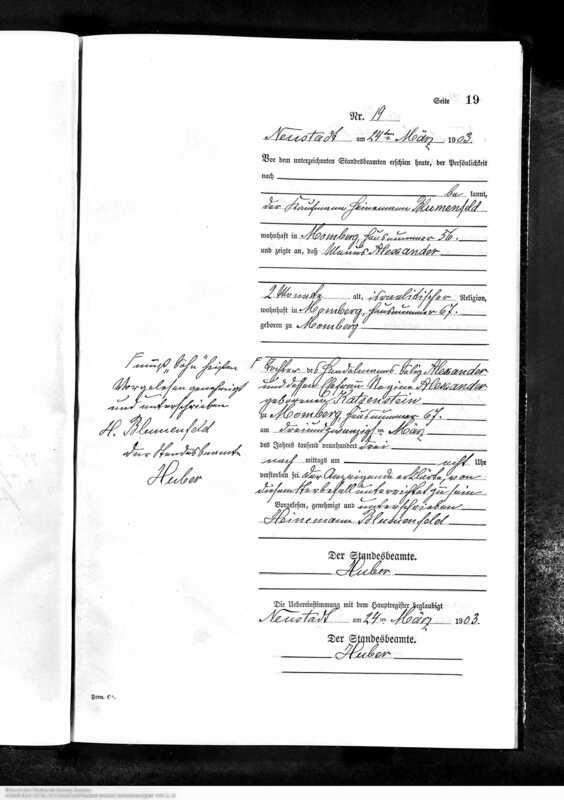 They were married in Frankenau on July 27, 1858. Wolf was not, as far as I can tell, a cousin. 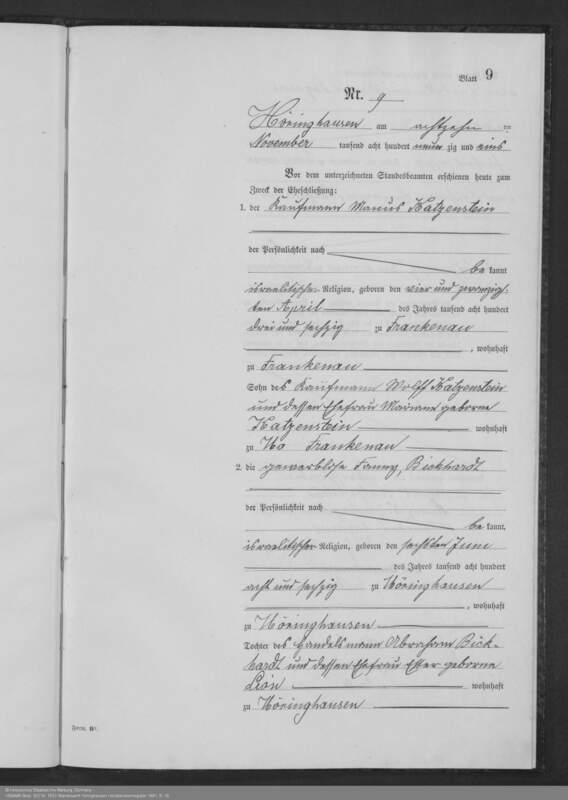 His father was Manus Katzenstein, born in Frankenau, and I’ve yet to find a familial connection between the Frankenau Katzensteins and the Jesberg Katzensteins. Wolf’s mother was Roeschen Mannheimer. When I initially only found two children born to Mina and Wolf, I thought that this part of the family would be much easier to research than that of Mina’s older sister Gelle Katzenstein Ruelf. But the more I looked, the more I found, and things became more and more complex. Mina and Wolf in fact had five children, all born in Frankenau: Rosa (1859), Karoline (1861), Manus (1863), Rebecca (1865), and Regina (1867). 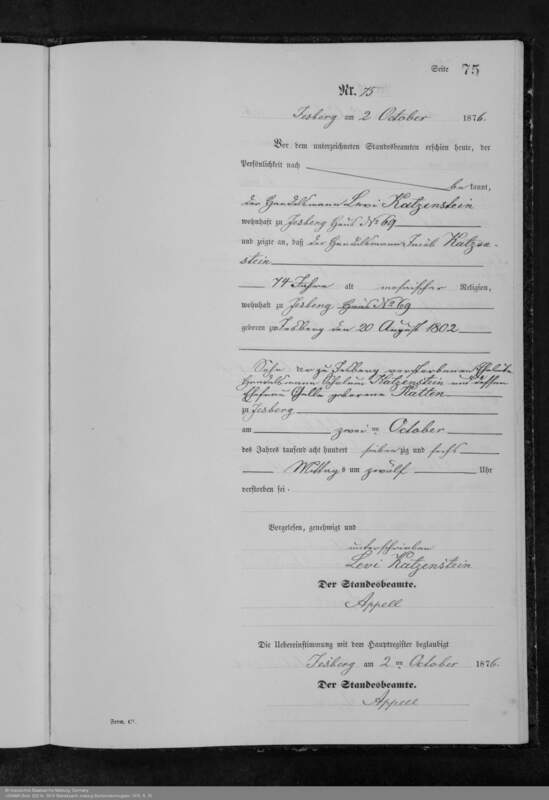 I located them by searching page by page through the birth register for Frankenau starting the year after Mina and Wolf’s marriage up through 1875. If there were others born later or elsewhere, I’ve not yet found them. 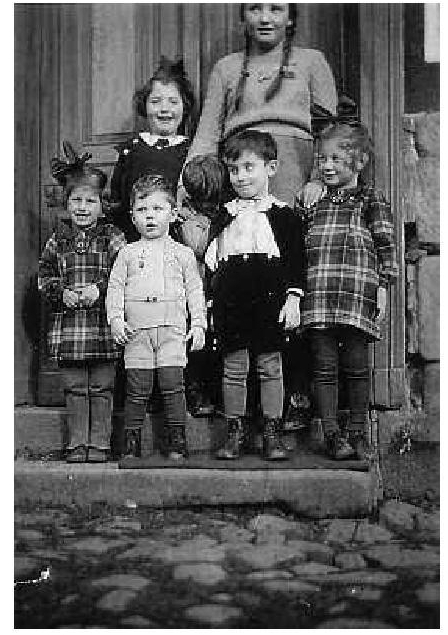 All five of those children lived to adulthood and were married, and four had children. And sometimes they married cousins within the Katzenstein family, making the research and the story even more convoluted. So from what I thought would be a simple one-post story of Mina and Wolf Katzenstein, I now have several posts to write about the large, extended family. This post will outline the growth of the family from 1859 through 1915. Subsequent posts will focus on each of Mina and Wolf’s children and their respective offspring. 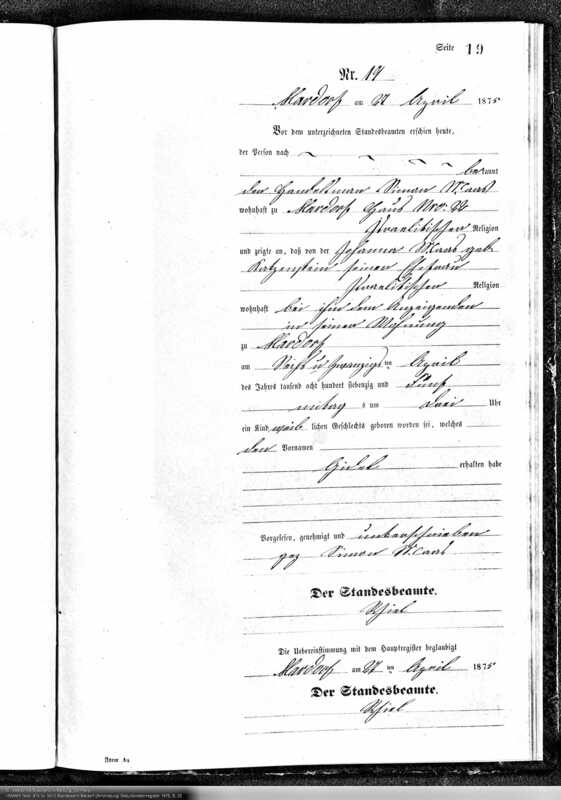 Rosa, the oldest child, was born on June 19, 1859, in Frankenau, eleven months after her parents’ marriage. She married Salomon Feist Katz on June 18, 1881, when she was 21 years old. Salomon was born on September 29, 1852, to Joseph Feist Katz and Brendel Katz, both of whom were born in Jesberg, as was their son Salomon. As you might have guessed, Salomon Feist Katz was also related to me and to his wife Rosa. We are all descendants of my 6-times great-grandfather Pinchas (Bonum) Katz. Rosa was my second cousin, twice removed, and Salomon my third cousin, three times removed. 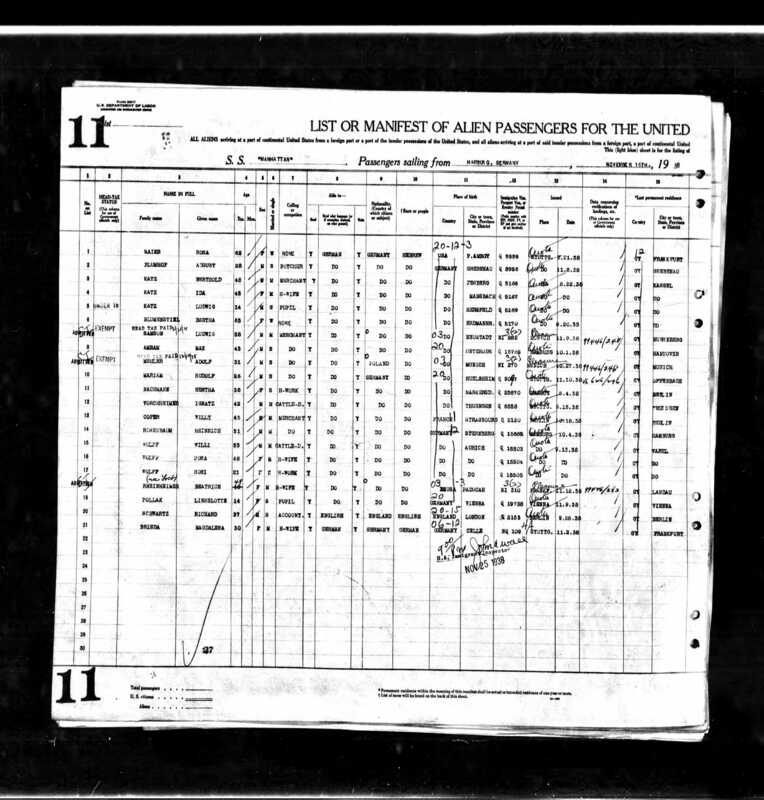 The numerous familial relationships between Rosa and her husband Salomon Feist were, for some reason, beyond the ability of my Family Tree Maker software to calculate, so I substituted Rosa’s sister Regina for Rosa and compared her to Salomon’s father Joseph Feist, and they came up as second cousins, twice removed, meaning that Regina and Salomon were third cousins, once removed, and thus so were Rosa and Salomon. Rosa and Salomon would have four children, all born in Jesberg: Zilli (1882), Sara (1883), Sophie (1885), and Recha (1889). 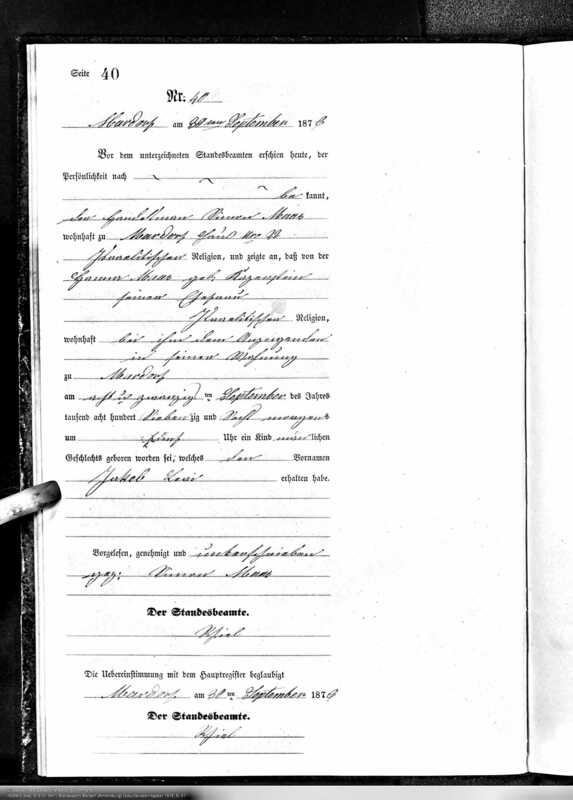 On October 10, 1884, she married Heinemann Blumenfeld, who, thank goodness, was not her cousin (as far as I can tell). He was born on October 8, 1854, in Momberg, Germany. 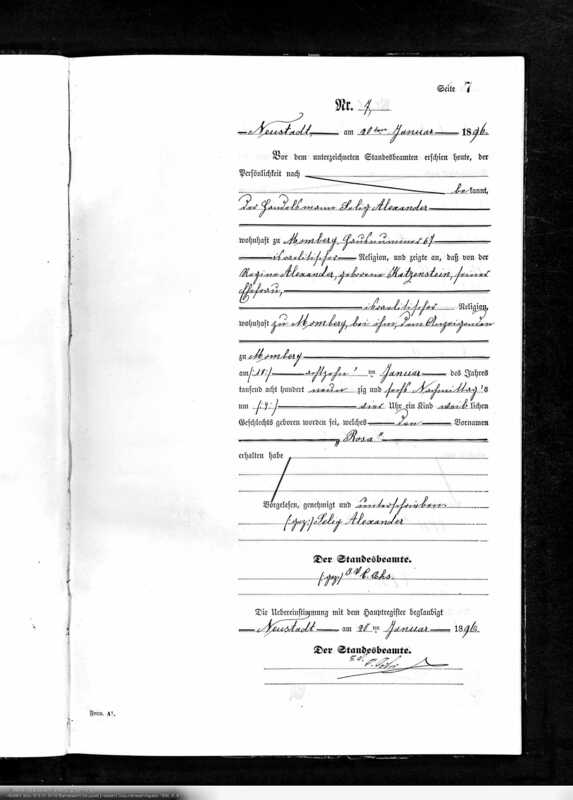 Karoline and Heinemenn had three children born in Momberg: Toni (1885), Moritz (1887), and Bella (1890). Manus Katzenstein was the middle child and only son of Mina and Wolf. He was born on April 23, 1863, in Frankenau. 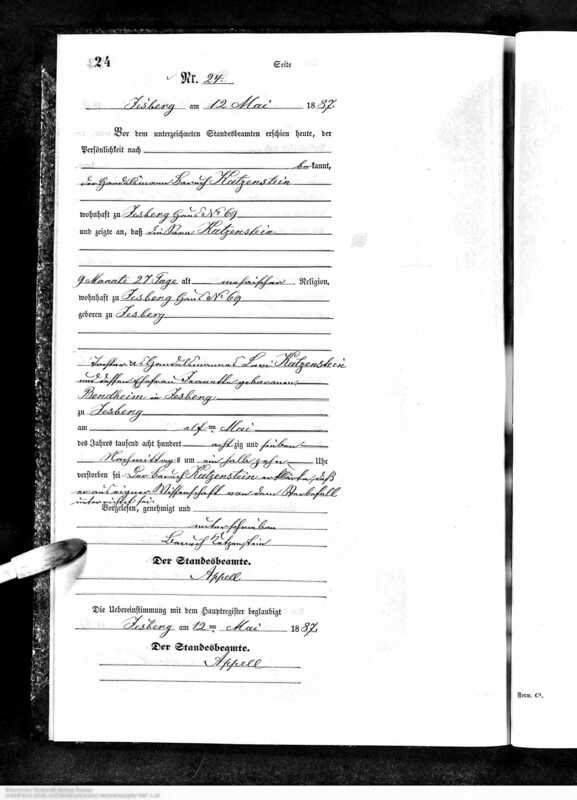 He married Fanny Bickhardt of Hoeringhausen, Germany, on November 18, 1891. Fanny was born in Hoeringhausen on June 6, 1868, daughter of Abraham Bickhardt and Esther Lion. Manus and Fanny did not have children as far as I’ve been able to determine. 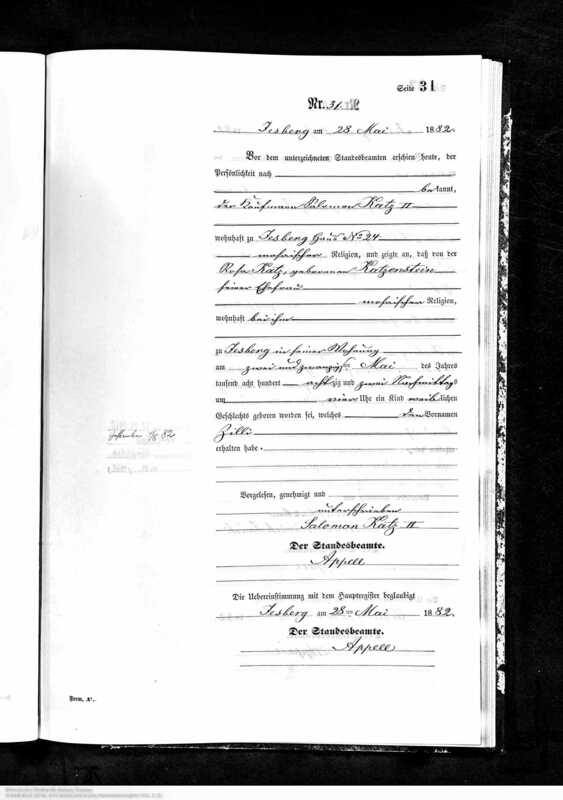 Wolf and Mina’s fourth child was Rebecca, born on August 28, 1865, in Frankenau. On April 30, 1889, she married Salomon Schalom Kneibel Katz (“Salomon SK Katz”), who was, you guessed it, a cousin. Salomon SK Katz was born in Jesberg on June 28, 1859, to Schneuer Kneibel Katz and Sarchen Rosenblatt. Like his cousin Salomon Feist Katz who married Rebecca’s older sister Rosa, Salomon SK Katz was a grandson of Pinchas Bonum Katz, my six times great-grandfather. 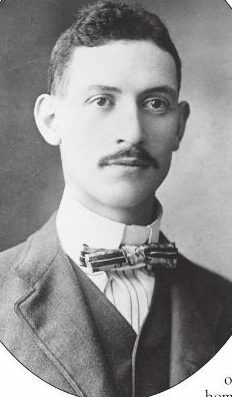 Salomon SK Katz and his brother-in-law Salomon Feist Katz were first cousins married to sisters, Rosa and Rebecca Katzenstein. And they were all descended from Pinchas Bonum Katz, as am I. 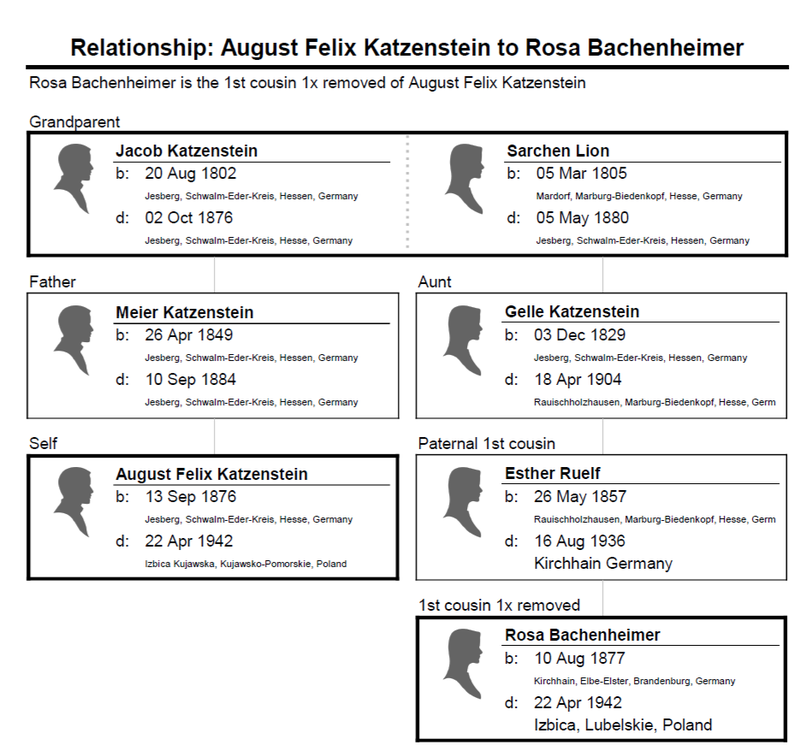 Once again, the relationship between Rebecca Katzenstein and Salomon Schalom Kneibel Katz proved too confusing for my software, but when I used Rebecca’s sister Regina again and compared her to Rebecca’s father-in-law, Schneuer Katz, it showed Regina and Schneuer as second cousins, twice removed, meaning that Regina and thus her sister Rebecca were third cousins, once removed, of Salomon SK Katz. 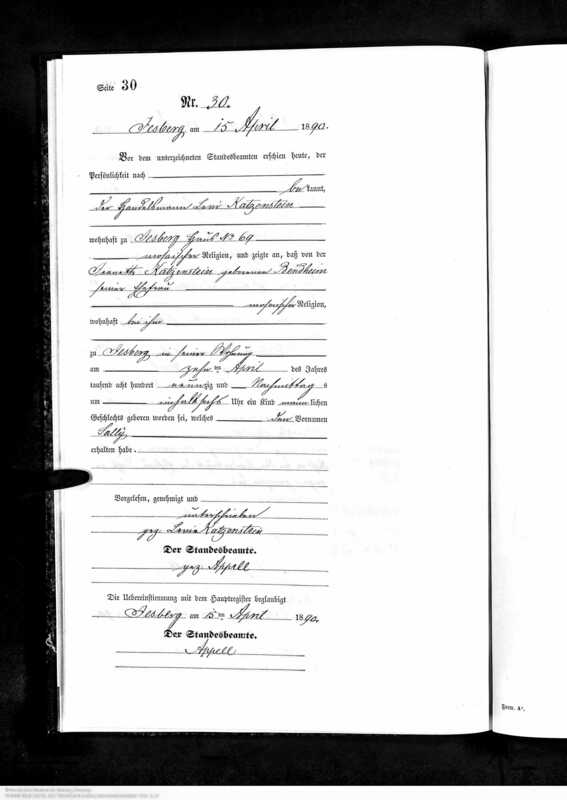 Rebecca Katzenstein and Salomon SK Katz had four children, all born in Jesberg: Berthold (Pinchas) (1890), Theresa (1891), Julius (1893), and Jakob (1895). 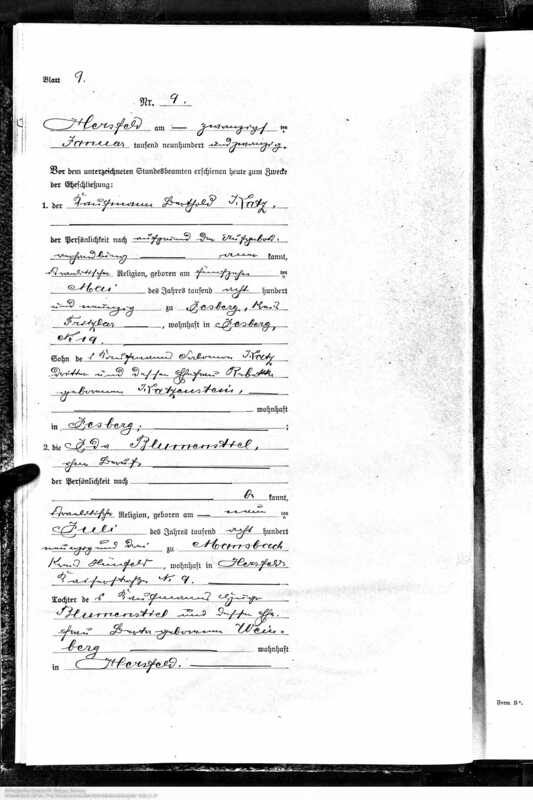 Regina Katzenstein was the youngest child of Mina and Wolf Katzenstein; she was born on September 24, 1867, in Frankenau. She married Selig Alexander, the son of Joseph Alexander and Fradchen Frank of Momberg. Selig (sometimes called Seligmann) was born on September 20, 1861, in Momberg. 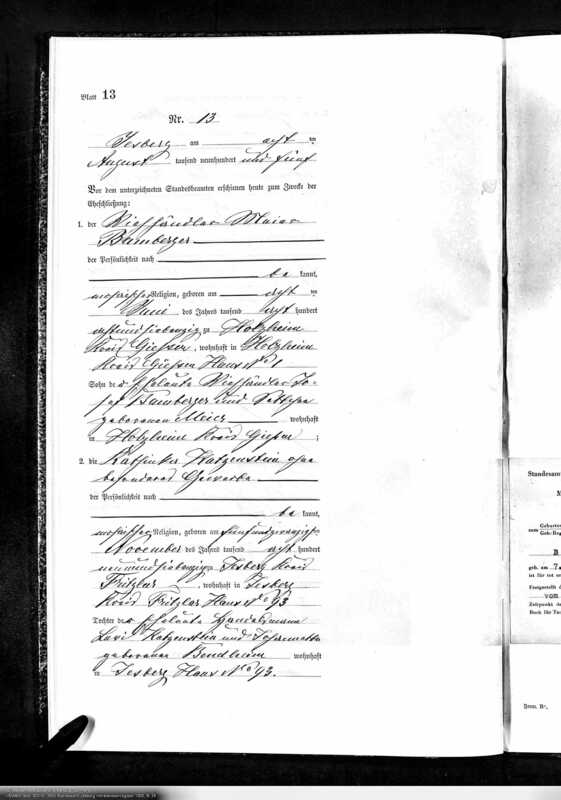 Regina and Selig were married on November 25, 1891, in Frankenau. 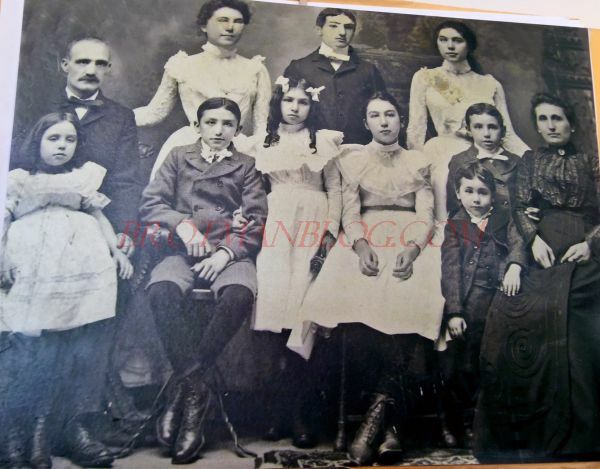 Regina and Selig Katz had six children: a stillborn child (1893), Bertha (1893), Rosa (1896), Mina (1897), Joseph (1902), and Manus (1903). As you might have inferred from the names of Regina’s children, her mother Mina had died before the birth of Regina and Selig’s fourth child Mina. Mina Katzenstein died on September 5, 1896, in Frankenau. She was 64 years old. Mina’s husband Wolf Katzenstein survived her by almost twenty years. He died at age 85 on March 18, 1915, in Frankenau. Mina and Wolf were survived by their five children and their grandchildren, whose stories will be told in posts to follow. Now if I ever discover that Mina and her husband Wolf were also cousins, well, then I may just suffocate in those mangrove roots! I am now returning to the story of my Katzenstein family. 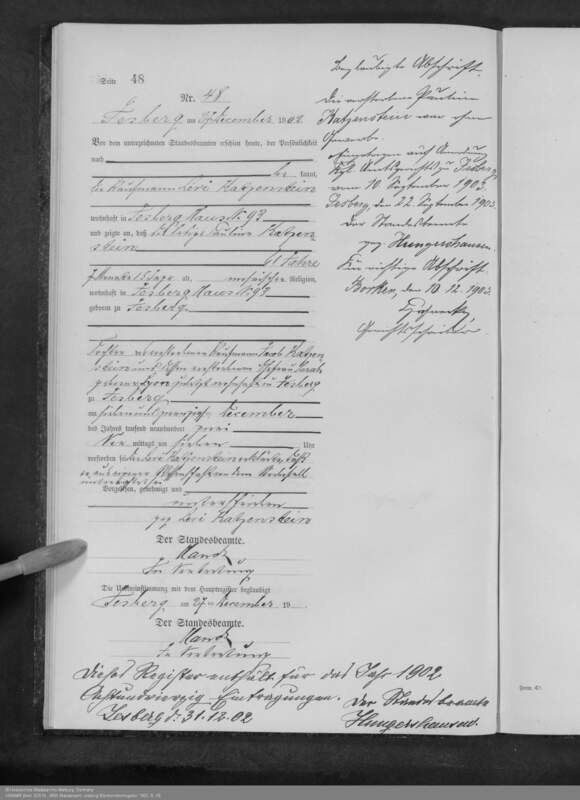 I’ve spent the better part of the last year researching and writing about my Katzenstein family: first, the family of my great-great-grandfather Gerson Katzenstein, who came to the US from Jesberg in 1857; then the family of Gerson’s half-sister Hannchen who married Marum Mansbach; their children came to the US around the same time; and then the family of Gerson’s full sister Rahel Katzenstein, who married Jacob Katz and whose children also for the most part came to the US and settled primarily in Oklahoma. I needed a short break to recover from the overwhelming sadness I felt as I discovered how many members of the family had died or suffered at the hands of the Nazis. Now I am ready to tell the story of the remaining sibling of my great-great-grandfather Gerson Katzenstein, his half-brother Jakob. Unfortunately much of the story of Jakob’s family also is devastatingly sad. But I need to tell it because these people need to be remembered and their memories need to be honored. 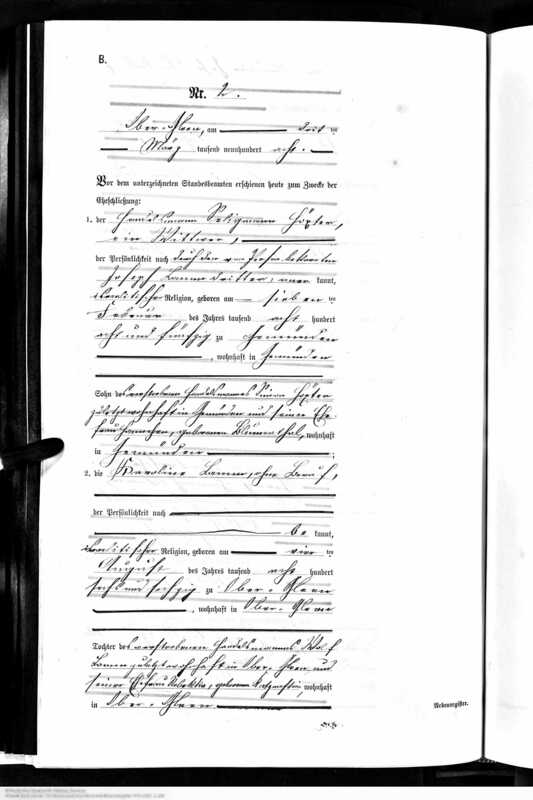 According to Barbara Greve’s research, Jakob was born on August 20, 1802, in Jesberg to Scholum ha Kohen Katzenstein and Gelle Katz (or Katten. He married Sarchen Lion on February 24, 1829; Sarchen was born on March 5, 1805, in Mardorf, Germany, to Baruch Loew/Lion and Michel Erhlich. Jakob was a merchant in Jesberg. Barbara Greve concluded that Jakob and Sarchen had nine children, all born in Jesberg: Gelle (1829), Michaela (1832), Schalum Abraham (1834), Rebecca (1836), Johanna (1838), Pauline (1841), Baruch (1844), Meier (1849), and Levi (1851). Jakob died in 1876, and Sarchen four years later in 1880. It will take quite a while to cover all nine of Jakob and Sarchen’s children. In this and the next several posts, I will focus on their oldest child, Gelle, and her family. Gelle was born December 3, 1829, in Jesberg, according to the research done by Barbara Greve. She married Moses Ruelf on January 21, 1855. Moses was born October 17, 1828, in Rauischholzhausen, Germany, the son of Juda Ruelf and Rachel Schlesinger. Moses Ruelf and Gelle Katzenstein had ten children, all born in Rauischholzhausen. The first child was stillborn on June 1, 1856; many trees on Ancestry have this child with the name Simon, but the record I found has no name given, nor does the Schneider book (p. 345). The second child was Esther, born May 26, 1857. 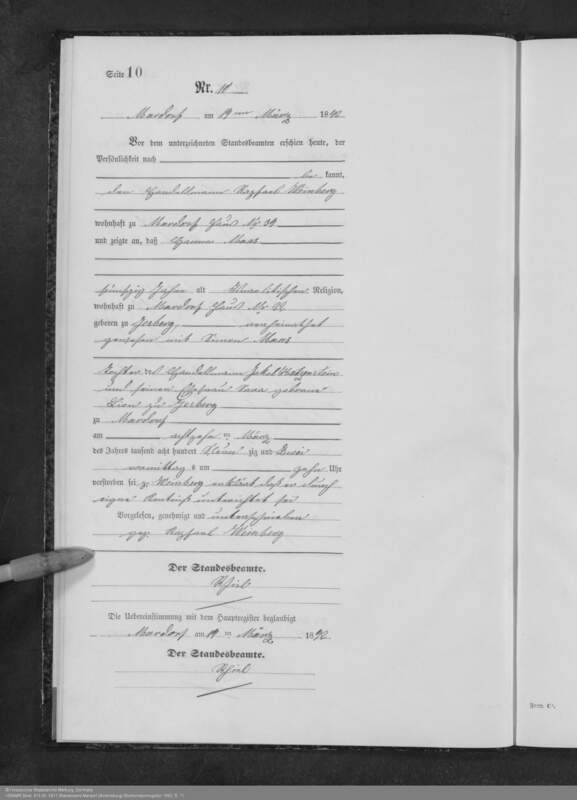 Her birth entry is on the same page as the stillborn child, above. As I wrote in an earlier post, Johanna was the first wife of Hirsch Abraham. Johanna died on August 12, 1890, eleven days after giving birth to her first child, who was apparently renamed Johanna in her memory. Although I’ve been unable to find a death record for Roschen, the Schneider book (p. 345) reports that Roschen died before her first birthday on March 3, 1865. 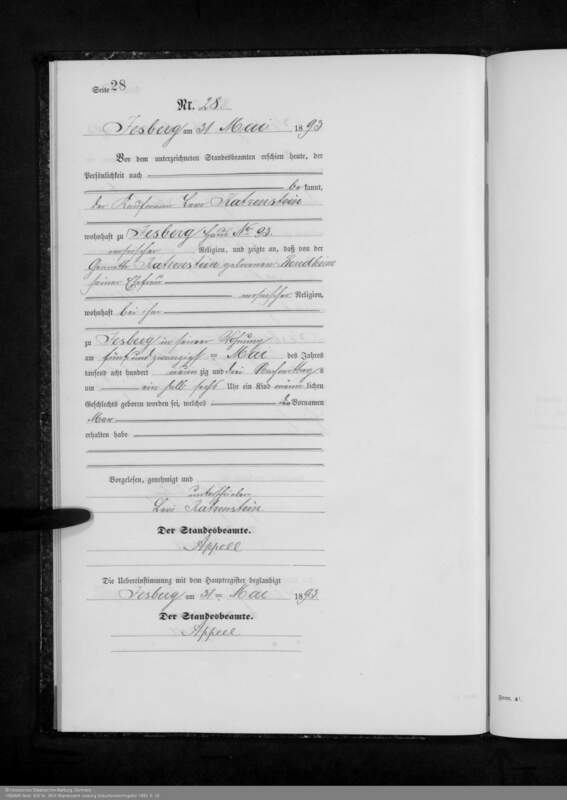 As I wrote in an earlier post, Pauline married Hirsch Abraham after her sister Johanna died. Pauline was the grandmother of my cousin Fred Abrahams, who wrote the memoir I posted here. The Schneider book (p. 345) reports that Gutmann died on July 10, 1873, when he was not quite twenty months old. I did not find any other record of Gutmann’s death. Thus, of the ten children to whom Gelle Katzenstein Ruelf gave birth, one was stillborn and two appear to have died as young children. Of the other seven, one (Johanna) died in the aftermath of childbirth. As for the other six—Esther, Minna, Bette, Rebecca, Juda, and Pauline—I have learned more about their lives and their descendants and will report on my research in the posts that follow. First, I will discuss Esther and Bette. Although all the family trees I’ve seen refer to Sarchen as Sarchen Lion, it appears that the family name was originally Loew, German for lion. At some point, however, even the German records started using the name “Lion,” not Loew.